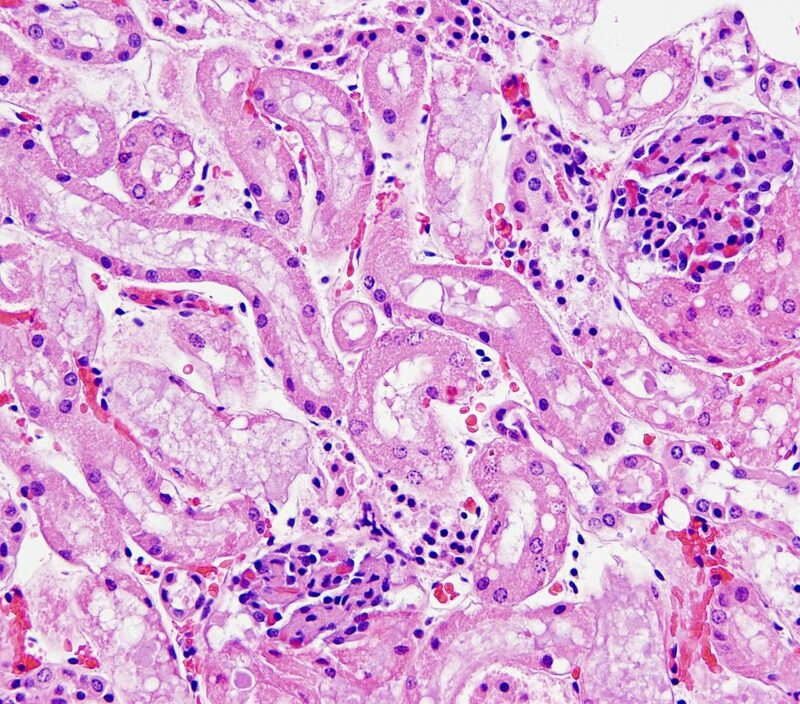 Tubular, interstitial and vascular injury often accompanies glomerular disease. 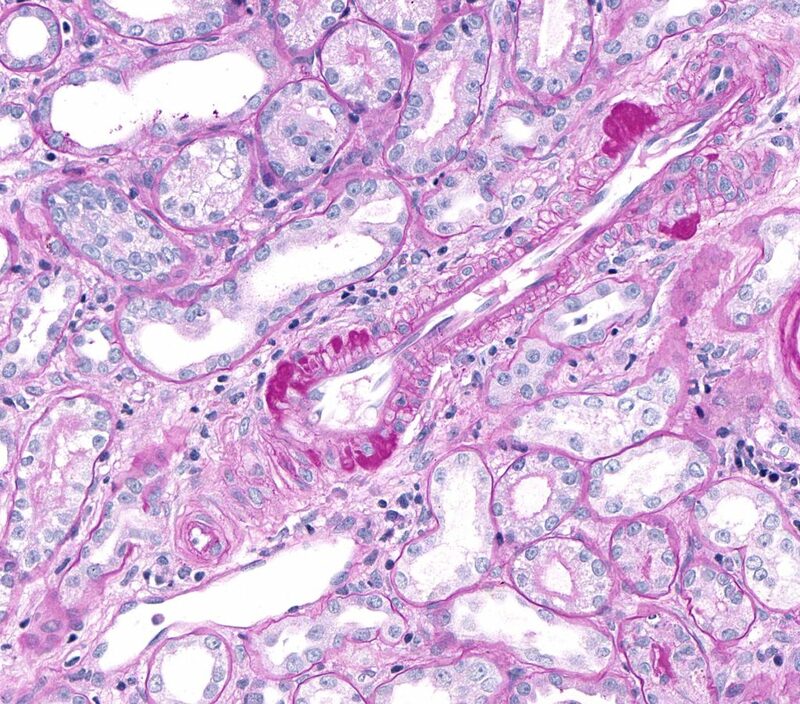 In this context these three compartments should be carefully evaluated because the lesions that develop participate in the development of renal disease and can influences the clinical outcome. 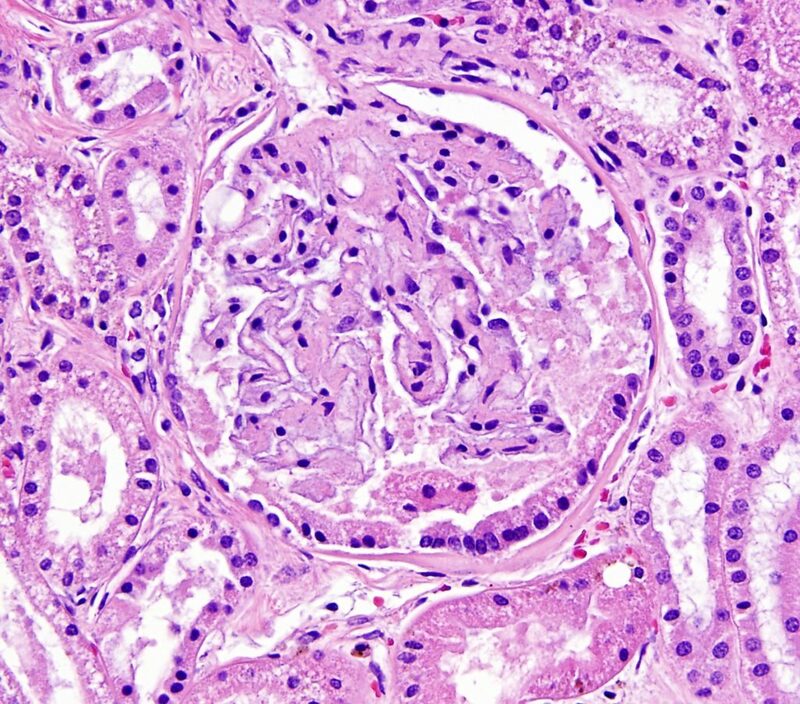 The morphological changes observed in the tubular, interstitial and vascular compartments are nonspecific and can also be recognized in renal diseases that do not have glomerular lesions as a component. The development of tubular lesions associated with glomerular disease depends on different factors. 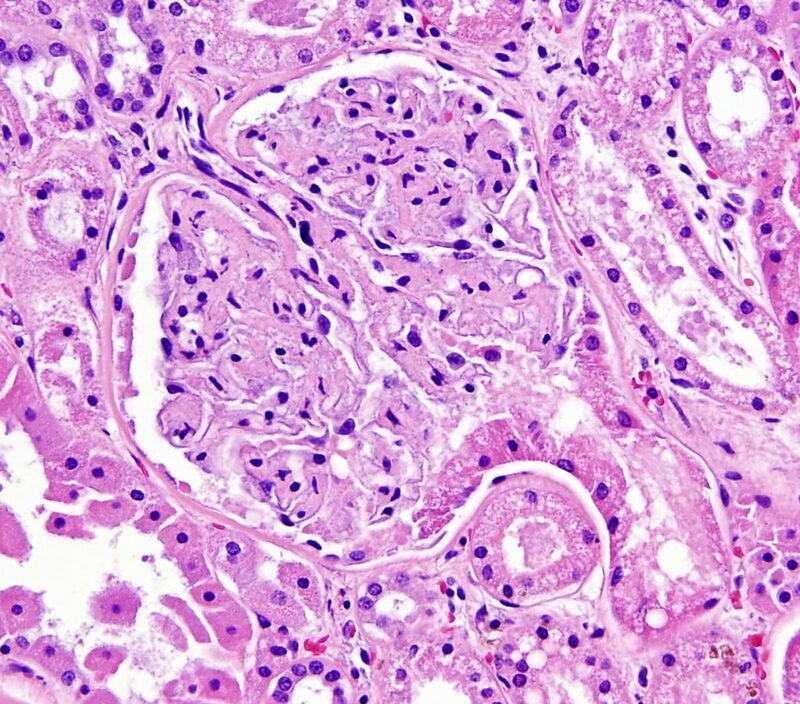 Post glomerular blood flow can be compromised in glomerular disease, which can lead to tubular and interstitial ischemia. Also, post glomerular blood can contain mediators arising from glomerular inflammation and immune-mediated hypersensitivity reactions, e.g., complement components. These mediators can initiate signal transduction pathways in tubular cells that generate chemotactic factors towards inflammatory cells and growth factors promoting fibrosis. Excess tubular reabsorption of albumin can have similar effects. In addition, signaling cascades leading to cell death by apoptosis can be activated. Vascular changes most often observed are due to the effects of hypertension on the vascular wall. 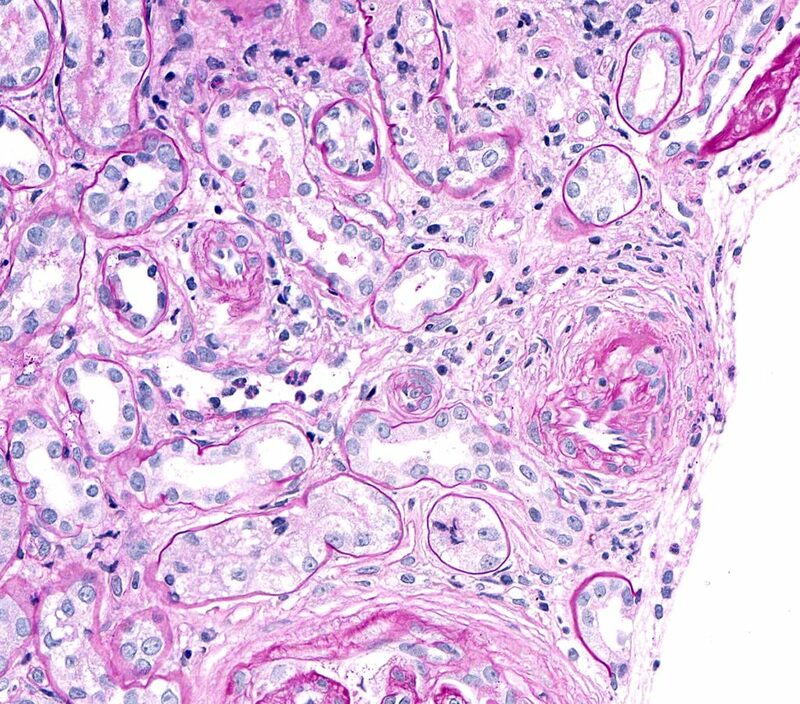 The main tubular lesions that accompany glomerular disease are those associated with acute tubular injury; lesions in the interstitium are an increase in the interstitial matrix and inflammation. Vascular changes are usually associated with hypertension. 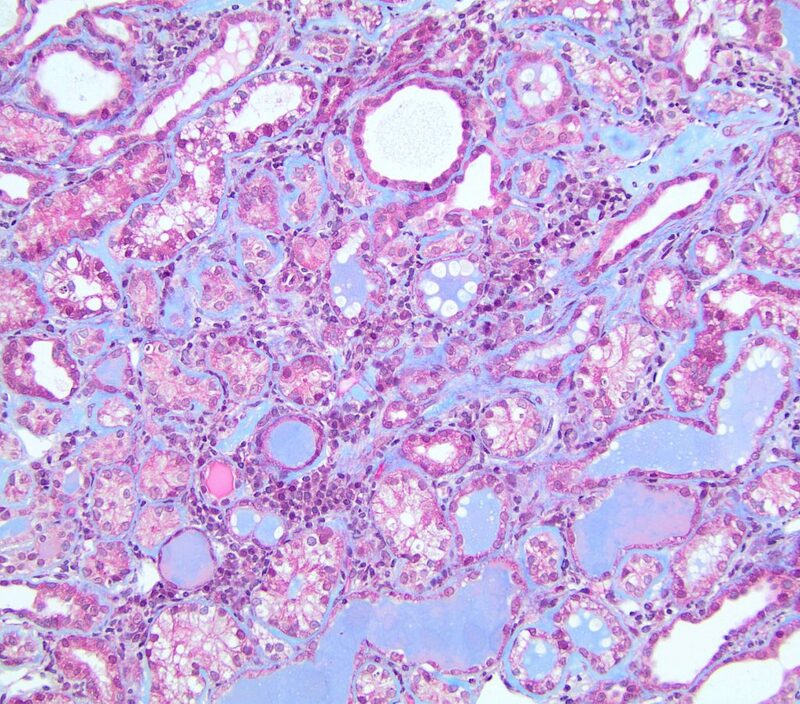 Diagnosis of tubular, interstitial and vascular disease is usually by light microscopy with the aid of special histochemical methods: PAS, JMS and a trichrome stain. Transmission electron microscopy and immunofluorescence often are not required but may be useful ancillary tests. 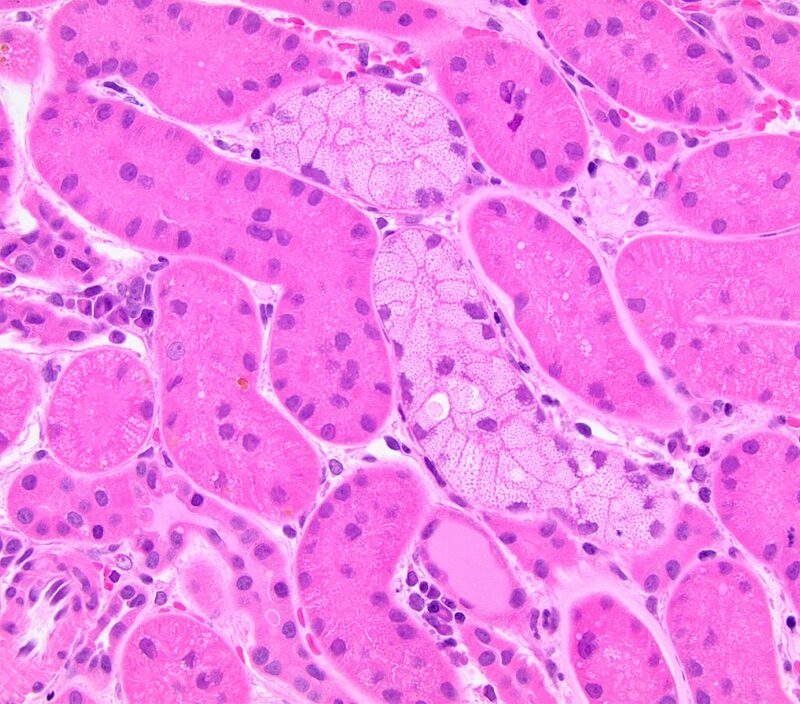 Protein casts are eosinophilic with HE stain and magenta with the PAS reaction. 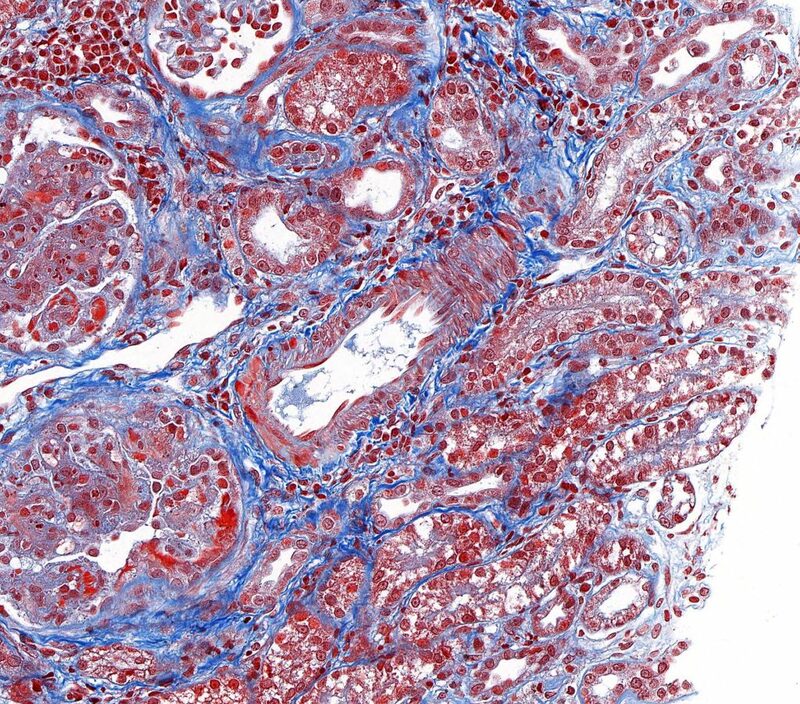 PAS positive staining is attributed to uromodulin (Tamm-Horsfall protein), a mucoprotein, which is secreted into the thick ascending limb of the loop of Henle. This mucoprotein forms the structure of protein casts. The presence of protein casts in the proximal tubular lumina suggests that there is distal tubular blockage. Interstitial amyloid is recognized as patchy deposits with the appearance of hyaline when stained with HE. It’s presence is confirmed by visualizing apple-green birefringence when Congo Red stained tissue sections are polarized. 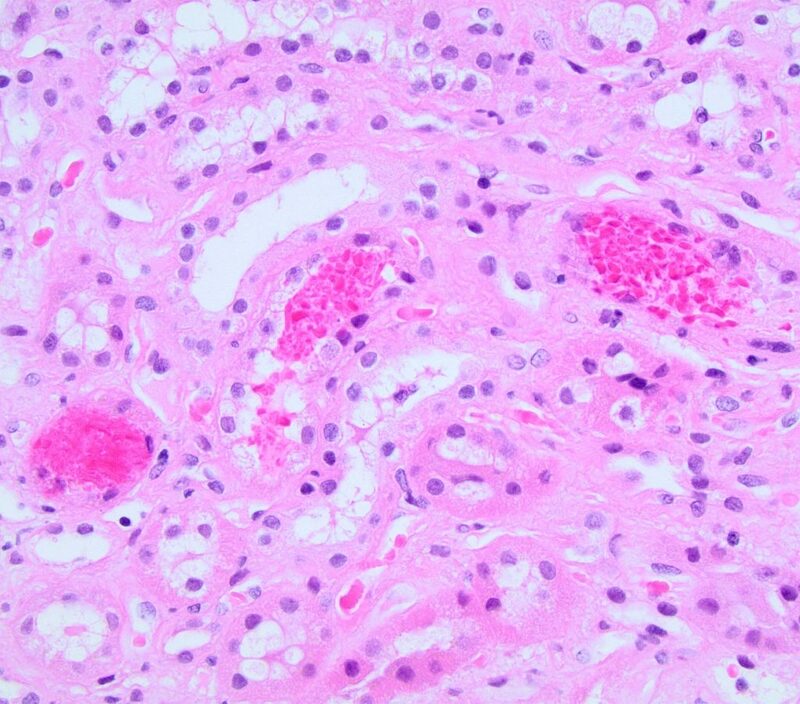 Interstitial amyloid may be observed with or without glomerular involvement. Vascular lesions in dogs might involve the renal arteries, arcuate arteries, intralobular arteries or the small arterial branches off of the intralobular arteries. These vessels might be sclerotic (e.g. arteriosclerosis) or have hyalinosis. Narrowing of the arteriolar lumens (afferent and efferent) can be due to hyperplastic arteriolosclerosis (not to be confused with arteriosclerosis or atherosclerosis) or hyalinosis. The sclerosis lesion is due to thickening of the smooth muscle wall, often resulting in an onion skinned appearance. Hyalinosis (at any level of the vascular tree) stains PAS – positive. It accumulates subendothelially, may extend into the media, and represents the accumulation of plasma-derived substances including various immunoglobulins, complement components especially C3, and fibrinogen. 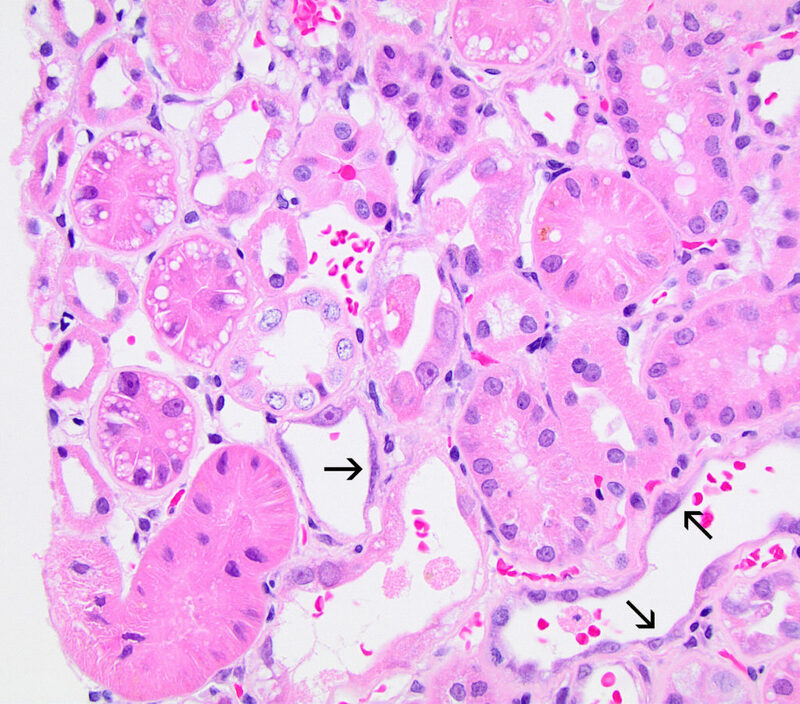 Fibrinoid necrosis of vessel walls associated with glomerular disease is rarely reported in the dog but has been reported in the condition known as cutaneous and renal glomerular vasculopathy. 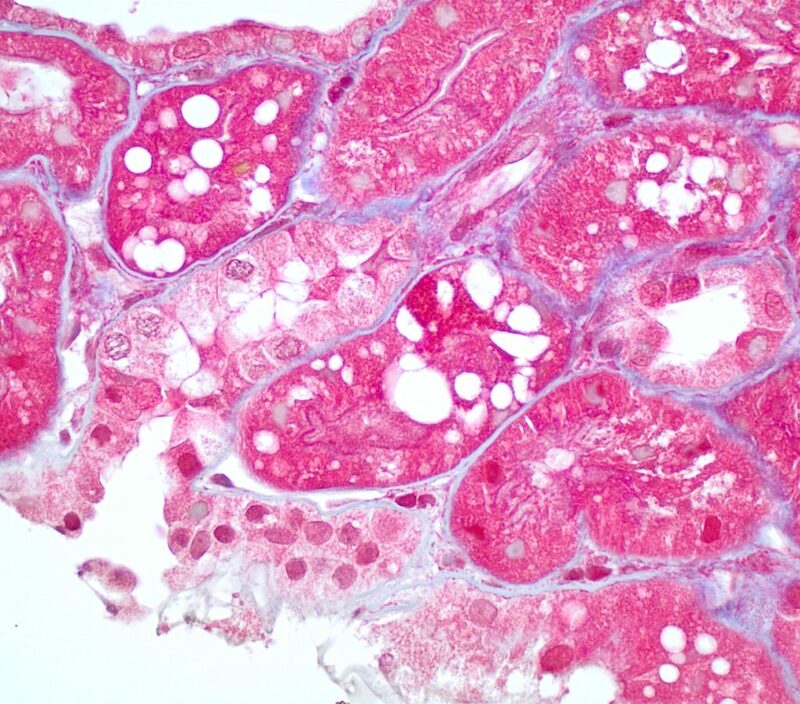 In this condition, acute kidney injury is attributed to thrombotic microangiopathy (TMA). The term ‘fibrinoid’ refers to the bright pink smudgy appearance of the vessel wall. This material morphologically looks like fibrin, but is mainly composed of necrotic debris, immune complexes and complement. The kidneys are composed predominantly of tubulointerstitium (TI). 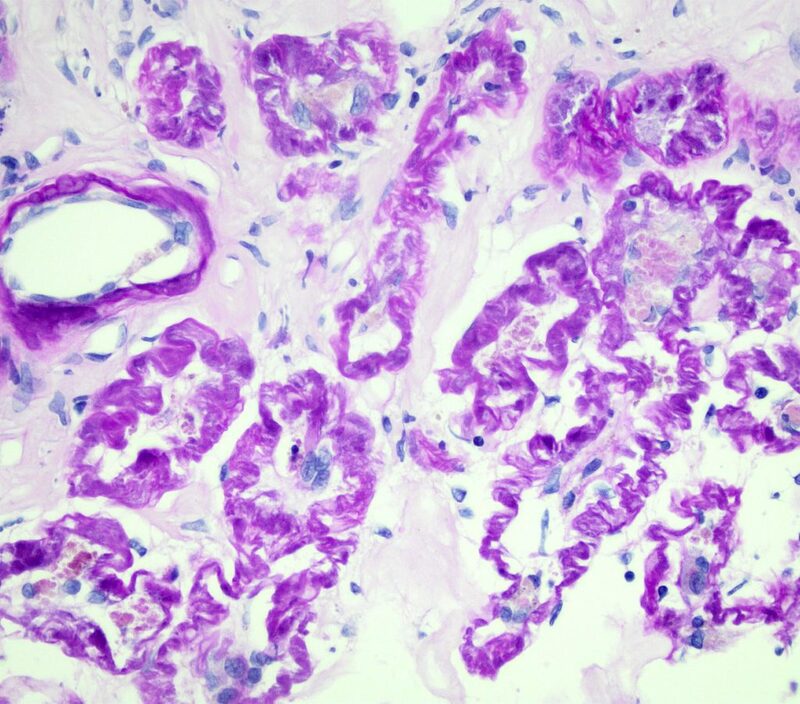 Therefore, renal function as determined by glomerular filtration rate (GFR) is impacted more by TI lesions than glomerular lesions, and the severity of damage to the tubulointerstitial compartment is most associated with GFR regardless of the inciting disease process. 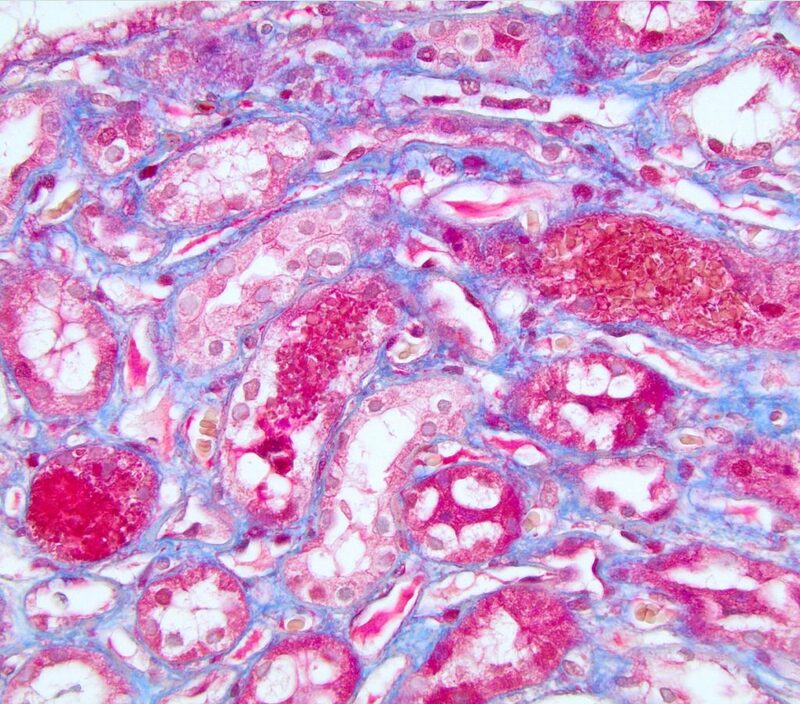 For instance, in cases of glomerular disease, observation of tubular atrophy and interstitial fibrosis and inflammation will likely be associated with decreased GFR, reflected by azotemia or inappropriately high creatinine concentration for the patient. These GFR markers typically increase corresponding to the severity of the lesions. Conversely, if no lesions are observed in the TI compartment, clinical evidence of decreased GFR is less likely. 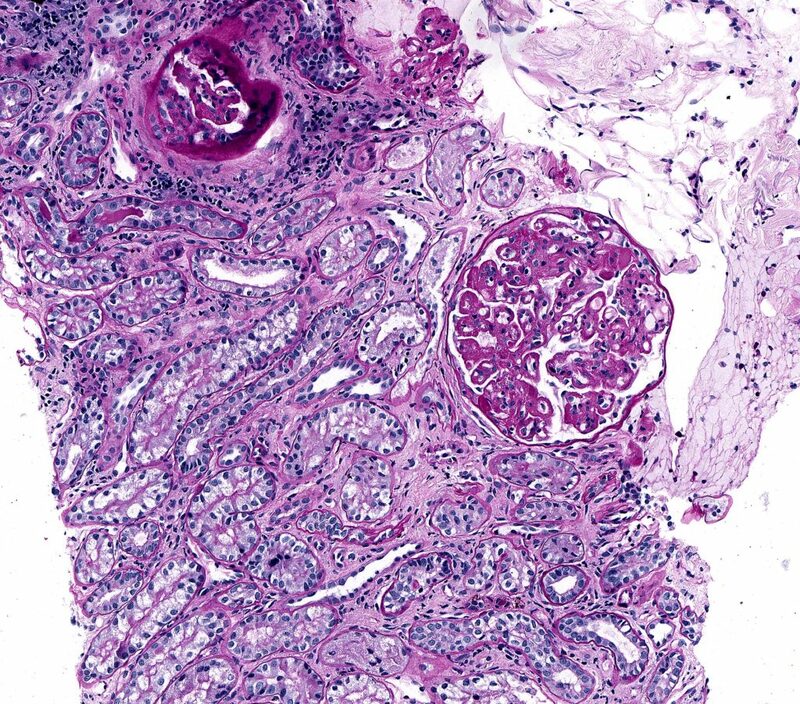 Because TI lesions can be patchy, the correlation of biopsy findings with GFR assumes the biopsy is representative of the kidneys as a whole. Hypertension is commonly observed in patients with kidney disease and can be both a contributor to and result of disease progression. 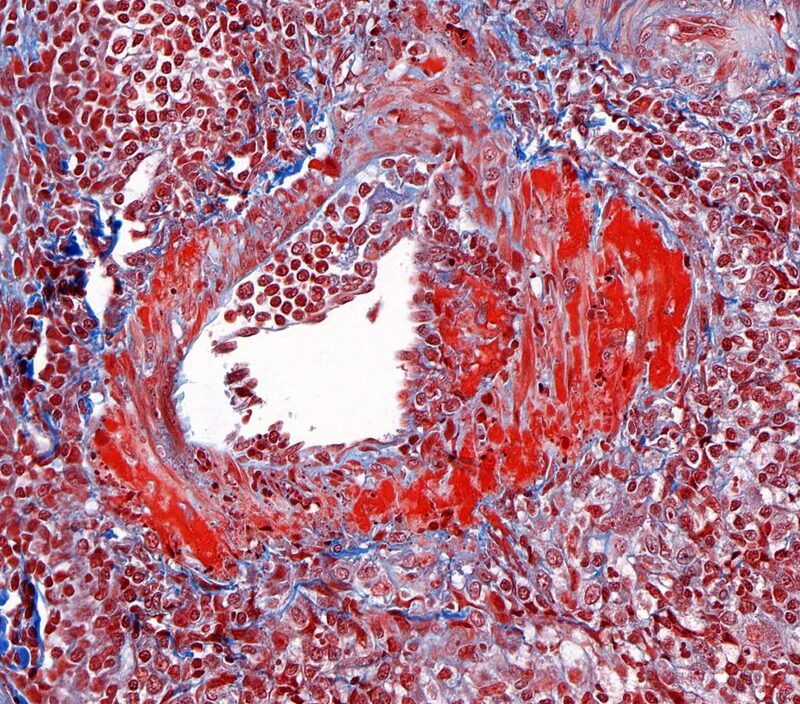 Vascular lesions (e.g., arteriolosclerosis, striped pattern of interstitial fibrosis and tubular atrophy) are often associated with hypertension , supporting that decreasing the blood pressure in these patients is important in mitigating disease progression. 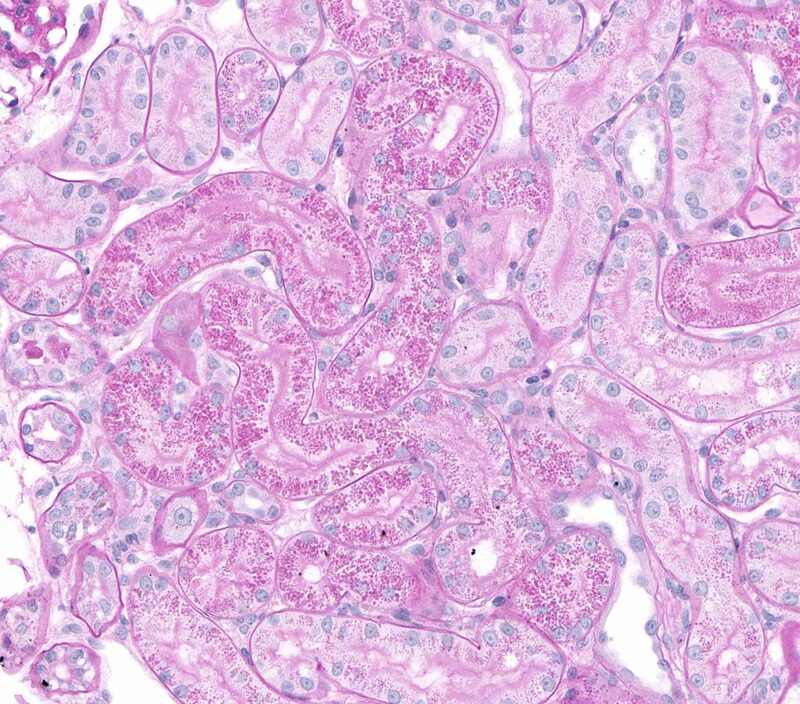 Tubular protein casts are commonly observed with glomerular disease, and these may correspond with the observation of hyaline (and/or other) casts in the urine. 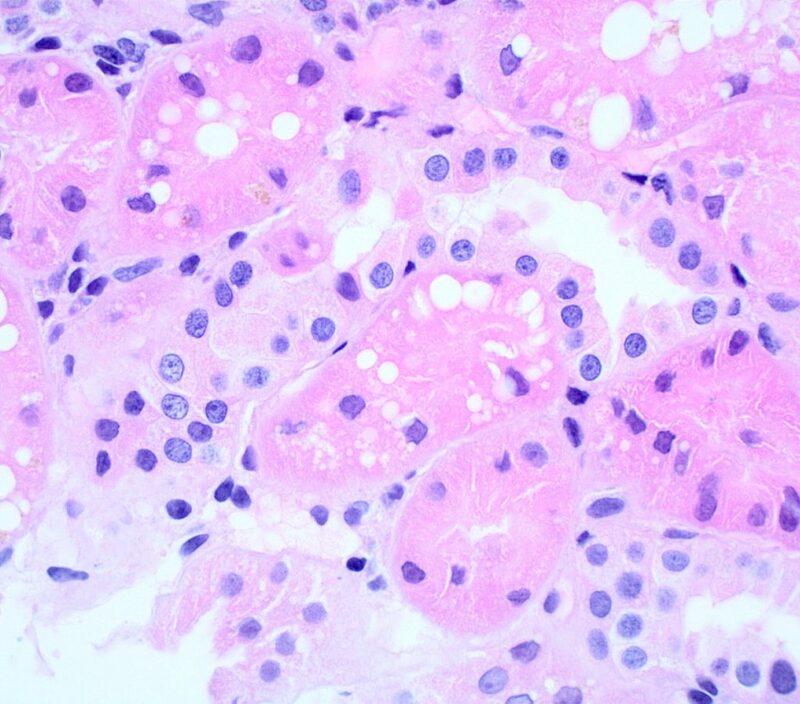 Glomerular proteinuria should be present in these cases. 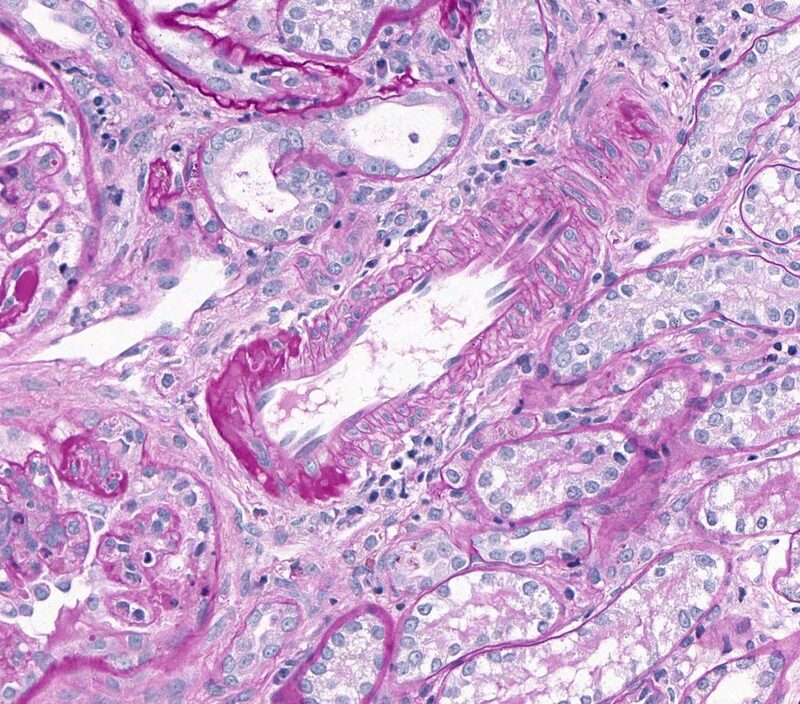 Although rare, RBC casts are typically associated with active glomerulonephritis accompanied by a decrease in GFR. If red blood cell (RBC) casts are seen histologically, one might expect their presence on a urine sediment. In cases of thrombotic microangiopathy, common clinical findings include: azotemia, thrombocytopenia, hemolytic anemia (with presence of schistocytes), proteinuria, and pigmenturia . Other common findings include hyperbilirubinemia, hypoalbuminemia, and hypertension. 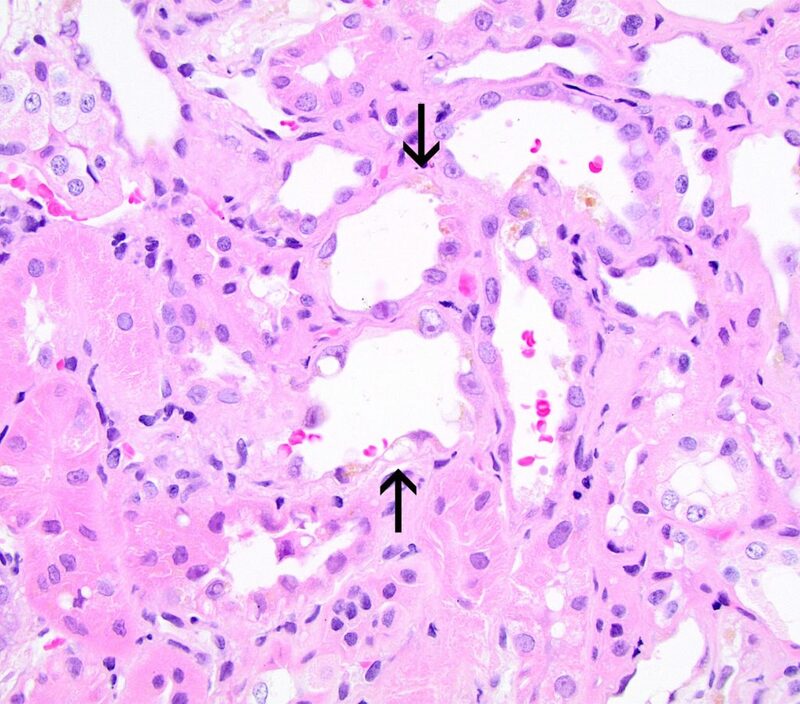 Tubular injury, as indicated by a variety of lesions described in this chapter, can contribute to the proteinuria observed in patients with glomerular disease. However, this contribution is typically minimal. Evaluation of urine proteins using gel electrophoresis reveals that the majority of dogs with glomerular disease have proteinuria secondary to both glomerular and tubular damage. While the TI component doesn’t usually contribute much to the magnitude of proteinuria, it can indicate significant TI disease. Besides proteinuria, other urinary indicators of tubular injury include amino aciduria, normoglycemic glucosuria and ketonuria. Sensitive and specific urinary indicators of tubular damage/injury are desired and are being tested on a research basis. None are commercially available at this point in time. However, in the future, it is anticipated that such biomarkers can support ongoing tubular injury. 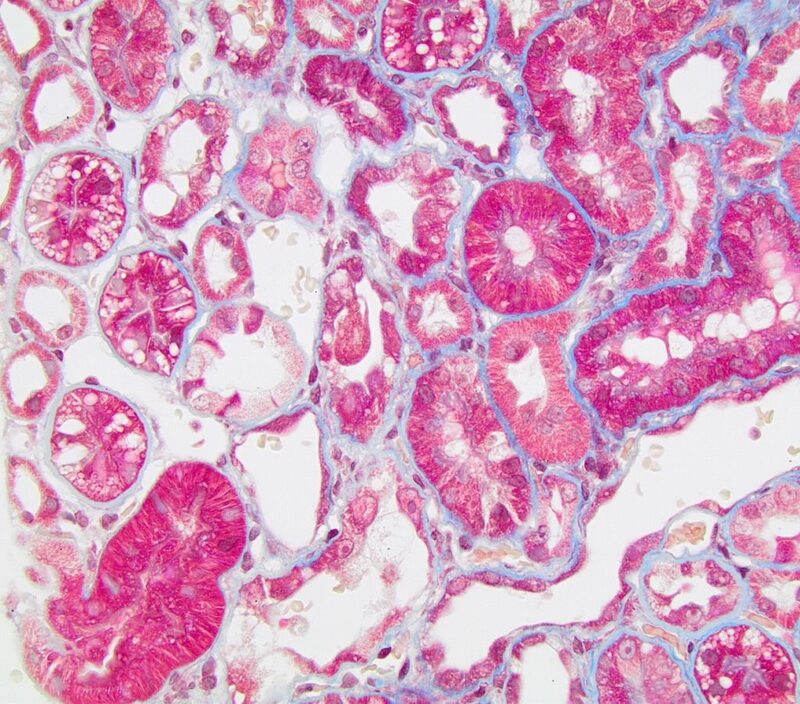 An advantage of evaluating the urine for injury markers is that urinary findings are representative of both kidneys in their entirety, whereas a biopsy may not sample the lesion. A major disadvantage, however, is that lower urinary tract disease (e.g., urinary tract infections) can complicate interpretation of such biomarkers. PROTEIN (HYALINE) DROPLETS are small, round eosinophilic deposits dispersed throughout the cytoplasm of tubular epithelial cells. They can be single or multiple and are best visualized with the PAS reaction. FIG.1A (HE): The epithelial cells lining many proximal tubules have small (1 to 2 micron) eosinophilic protein droplets in their cytoplasm. 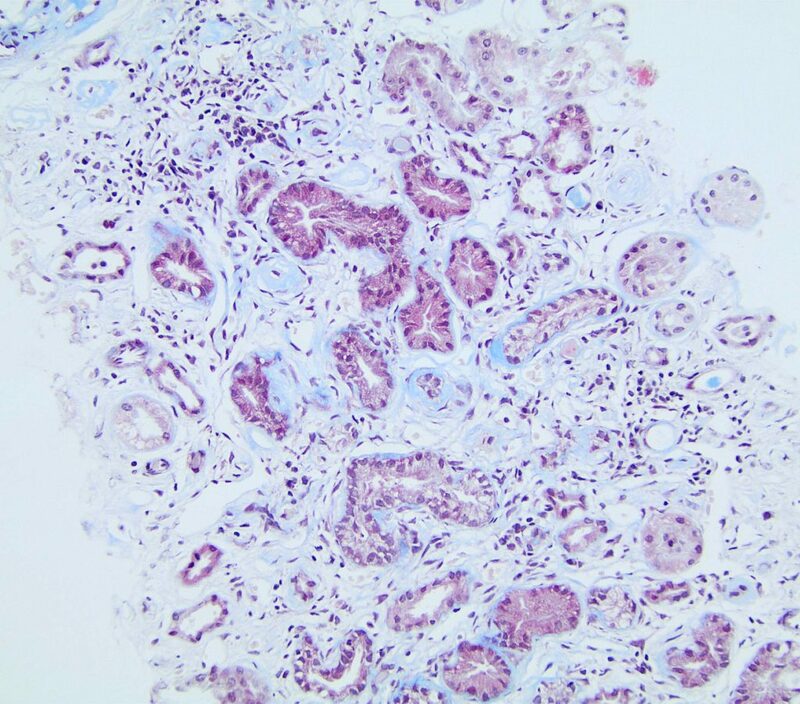 FIG.1B (PAS): The small protein droplets in the tubular epithelial cells are PAS positive. 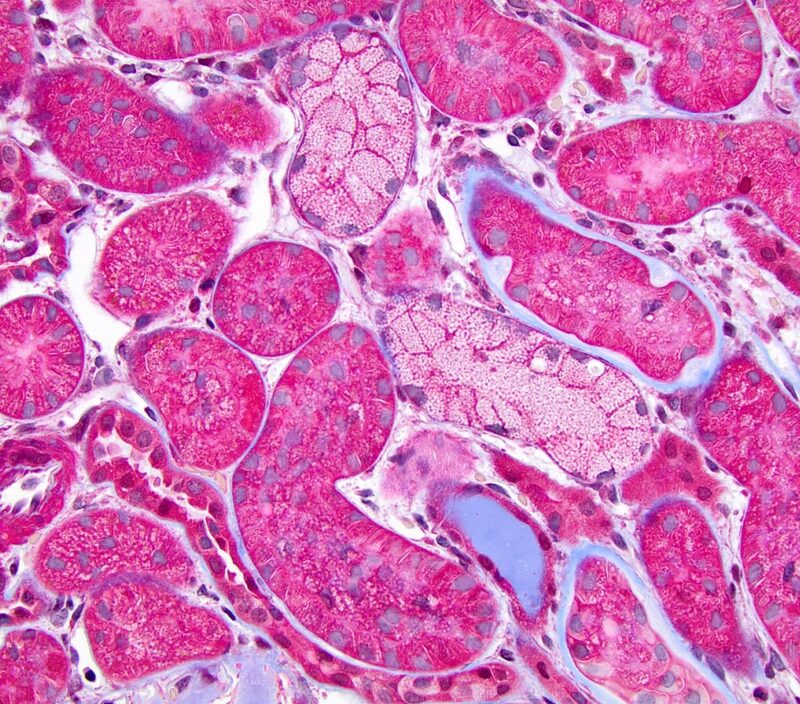 FIG.1C (MT): The small protein droplets in the tubular epithelial cells stain red with trichrome. 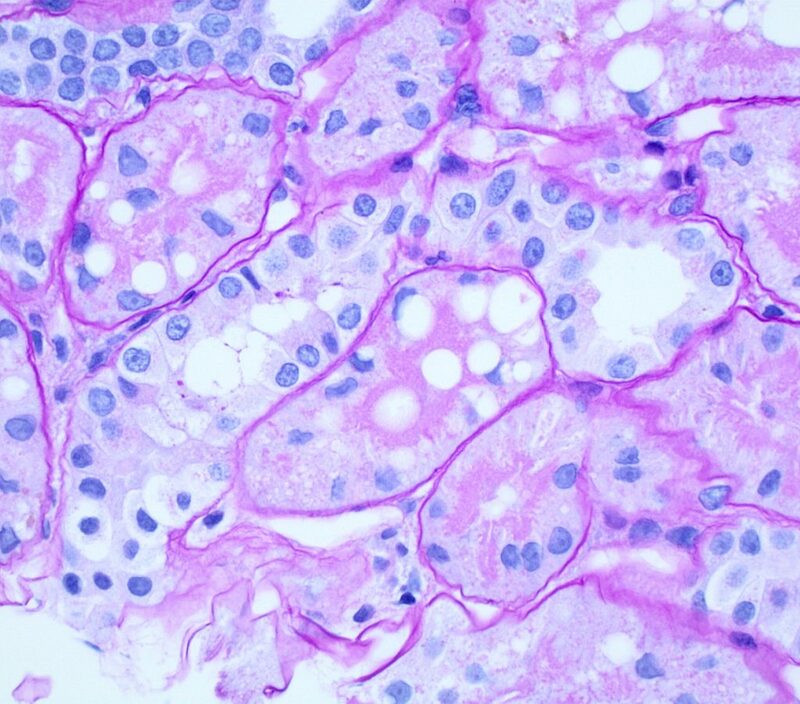 LIPID VACUOLES can be observed in nephrotic states. Lipid vacuoles appear as clear, round and variably sized. 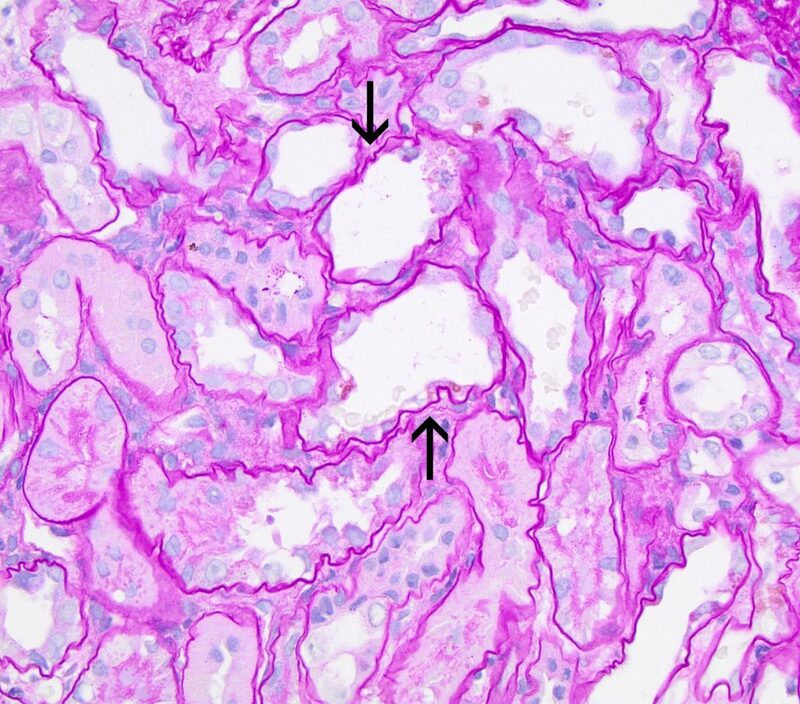 Lipid vacuolization is normal in the proximal straight tubules of dogs and should be considered abnormal in any other section of the nephron. FIG.2A (HE): Many tubular epithelial cells have clear cytoplasmic vacuoles which are lipid. FIG.2B (PAS): The cytoplasmic droplets are predominantly in the proximal tubular epithelial cells with the prominent PAS positive brush border. FIG.2C (MT): The clear vacuoles are located in proximal tubules. ISOMETRIC VACUOLIZATION refers to fine, uniformly sized, clear vacuoles that fill most or all of the cytoplasm. They often result from the use of carbohydrates as plasma expanders. FIG.3A (HE): Two tubules are lined by epithelial cells with myriad small (1-2 micron) discrete vacuoles all of similar size. FIG.3B (PAS): This stain enables one to clearly see the discrete, similarly sized vacuoles. FIG.3C (MT): Other tubules in this field also have vacuoles but their cytoplasm is not as distended as the tubules with isometric vesiculation. TUBULAR SIMPLIFICATION refers to a thinning of the tubular epithelium. This is the sequel of individual cell necrosis/apoptosis and represents the spreading and thinning of neighbor cells to cover the basement exposed by sloughed dead cells. The term attenuation is also used to describe this change. FIG.4A (HE): Tubules are lined by cuboidal instead of columnar epithelium and some tubular lumens contains sloughed cellular debris. 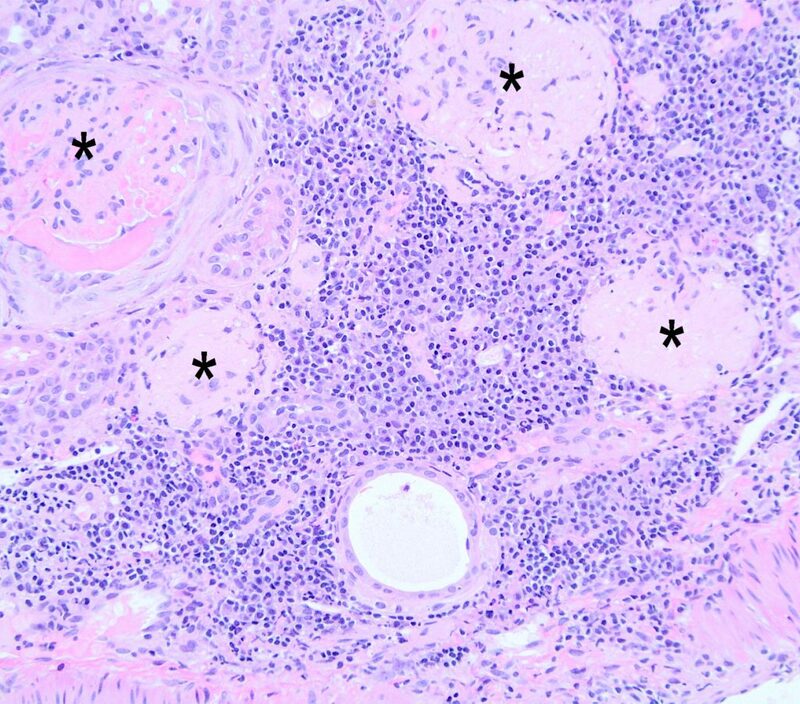 FIG.4C (PAS): This stain demonstrates that many tubules in addition to injured ones (arrows) lack a PAS positive brush border. FIG.4D (MT): The simplified tubules have minimal cytoplasm resulting in an irregular shape of the tubular lumens (arrows). There is minimal to mild interstitial fibrosis. LOSS OF THE APICAL BRUSH BORDER is another feature of tubular simplification and represents early tubular injury. The brush border is visualized on the apical surface of proximal tubular epithelium with the PAS reaction. FIG.4E (HE): Many tubules lack a brush border. 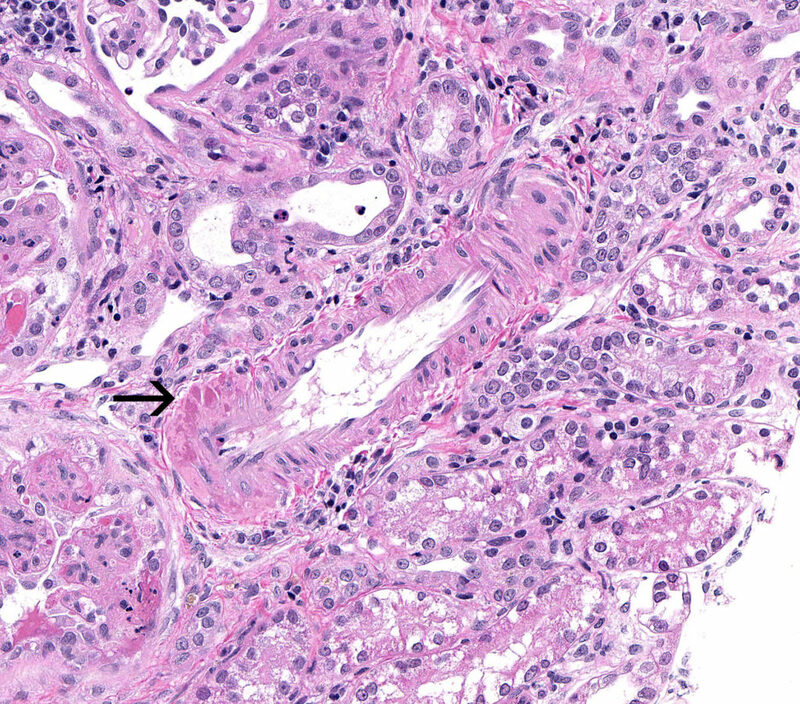 Some epithelial cells have stretched to cover the tubular basement membrane (arrows) and a few cells are karyomegalic. Other examples of injury include singly necrotic epithelial cells in tubular lumens and cytoplasmic vacuolation. FIG.4F (PAS): Many tubules lack a PAS positive brush border but some maintain theirs. Patchy injury such as this, wherein some tubular segments are damaged and others are not, is typical. FIG.4G (MT): Tubular epithelial simplification and loss of the brush border is also evident with MT. 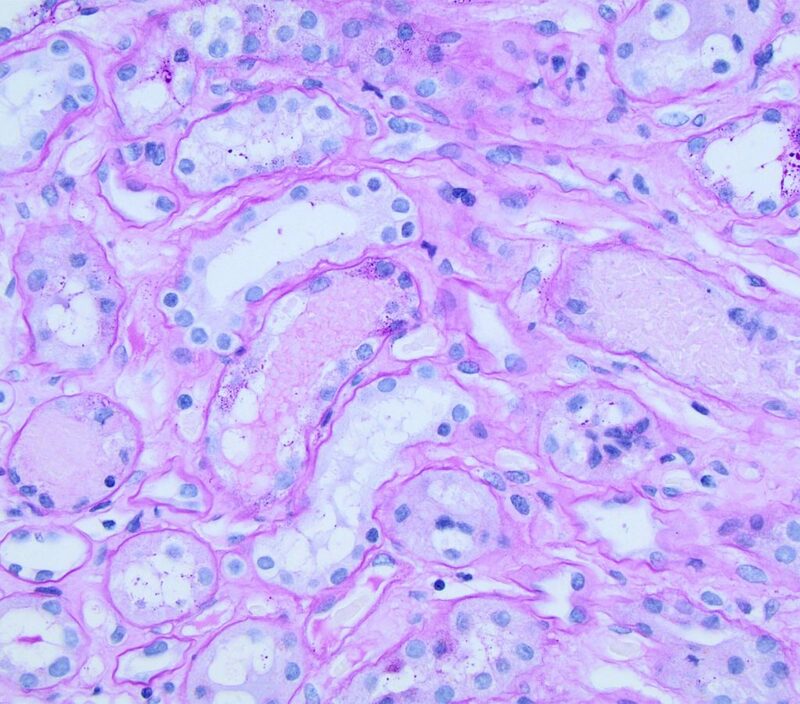 There is minimal interstitial fibrosis. 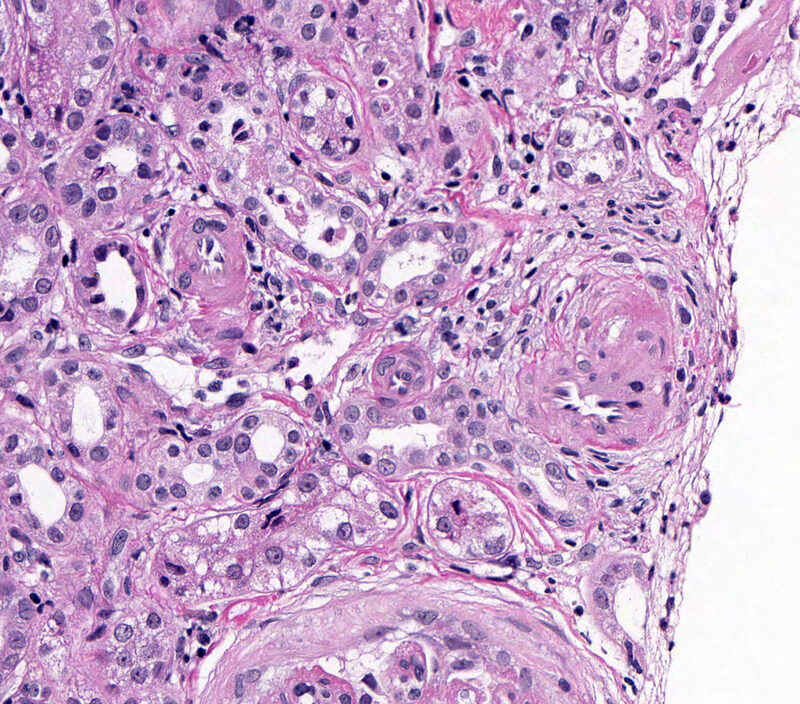 SINGLE CELL NECROSIS / APOPTOSIS is the presence of individual dead cells in the tubular epithelium. 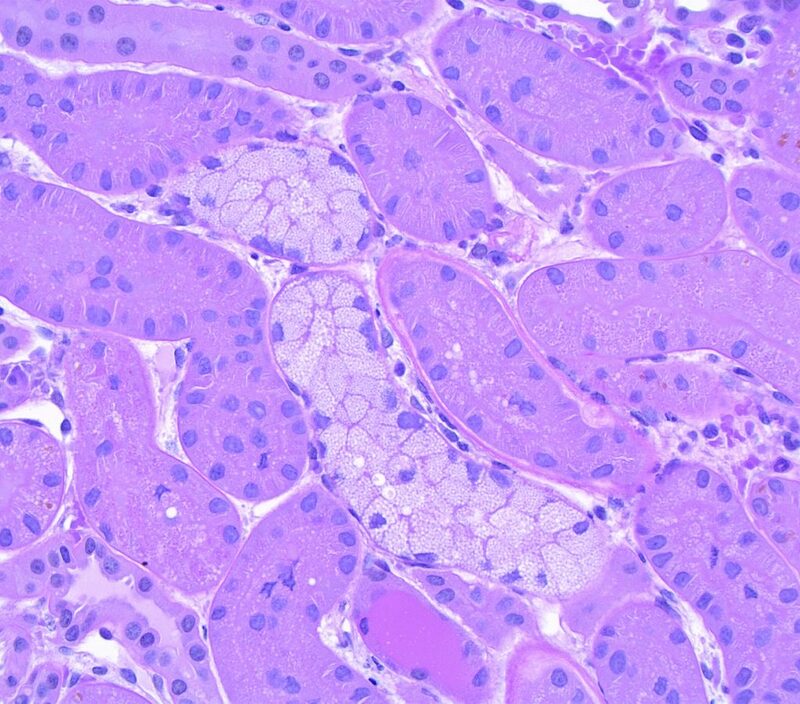 These cells are most easily identified by the presence of nuclear changes characteristic of dead cells: pyknosis, karyorrhexis and karyolysis. Individual dead cells may also be free in the lumen. FIG.5A (PAS): This tubule has 3 cells with pyknotic nuclei (circled) indicative of single cell death (likely apoptosis). 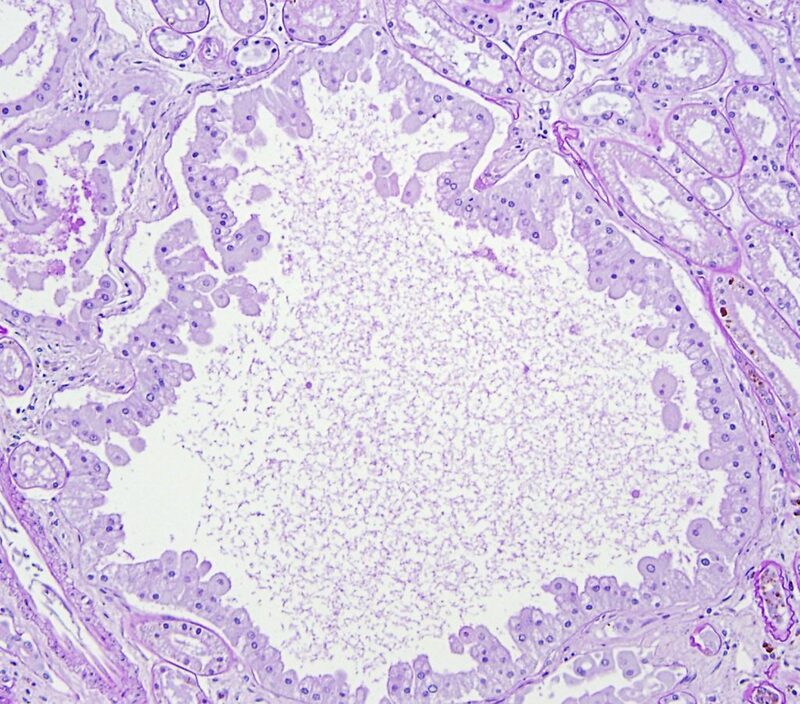 There is also a portion of a glomerulus in the lower left corner with hyalinosis of the vascular pole. 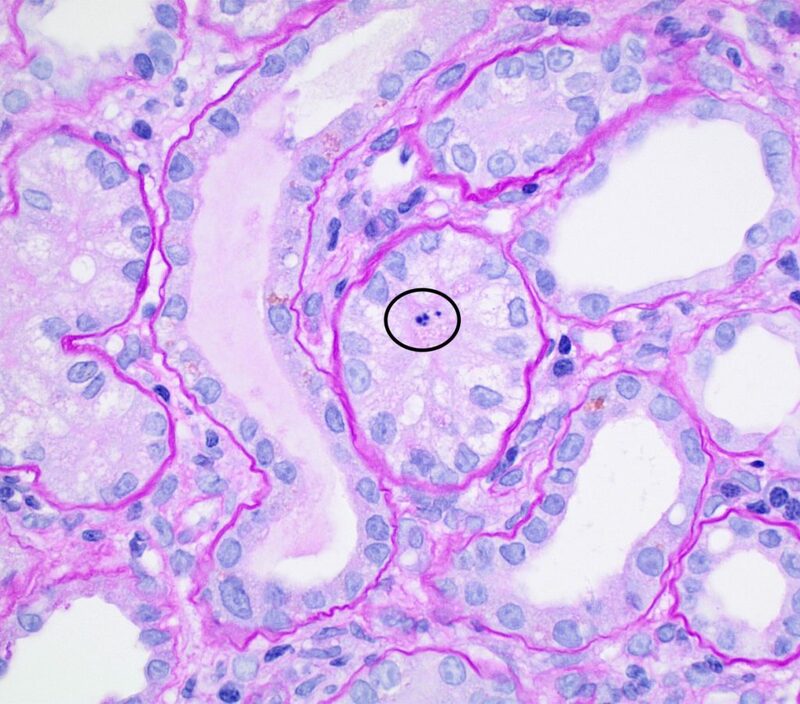 FIG.5B (PAS): This tubule has a cell with pyknotic nuclei (circled) indicative of single cell death. The other tubules in this field are characterized by loss of the apical brush border. FIG.5C (PAS): This tubule also had a pyknotic epithelial cell (circled) and the remaining nuclei vary from closely crowded to absent. Most tubular basement membranes are mildly wrinkled. Other tubules are characterized by loss of the apical brush border. FIG.5D (PAS): This tubule has 2 cells with pyknotic nuclei (circled), whereas mitotic figures are also observed (arrow) indicating tubular epithelial regeneration. Tubular basement membranes are mildly wrinkled. ERYTHROCYTE CASTS (RED BLOOD CELL CASTS /RBC CASTS) suggest an acute glomerulonephritis or trauma to the kidney. When passed into the urine they can be a non-invasive way to detect activity of a glomerular disease; however, RBC casts are more often used a biomarker in humans than in dogs. 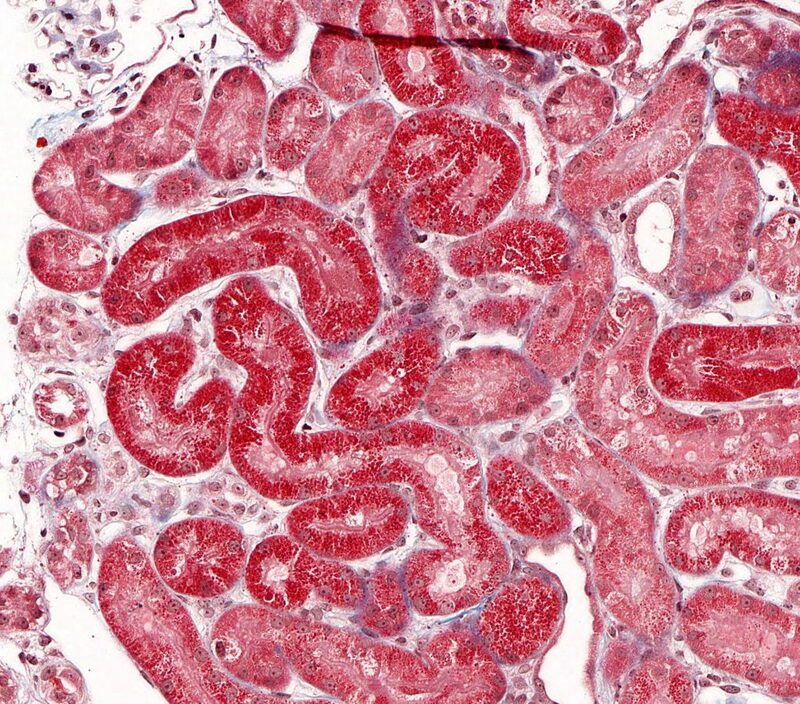 FIG.6A (HE): This tubule contains linear red to pink casts (RBC casts), which indicate that the glomerular capillary walls have been damaged, allowing passage of erythrocytes though the glomerular filtration barrier. Once in the tubular lumens, they are often degraded and mixed with proteins such as Tamm Horsfall mucoprotein. FIG.6B (HE): Sometimes, the red blood cells in tubular lumens appear as short polyhedral structures (compare to FIG 6A). 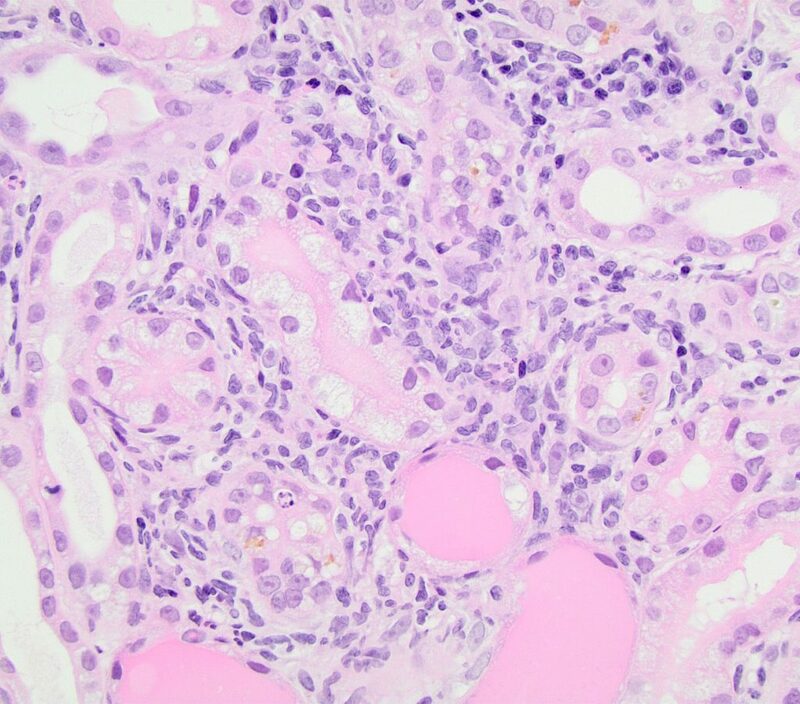 FIG.6C (PAS): Red blood cell casts should be pale pink when stained with PAS, compared to proteins casts which are often brighter pink. FIG.6D (MT): With MT, the erythrocytes are bright red to orange. 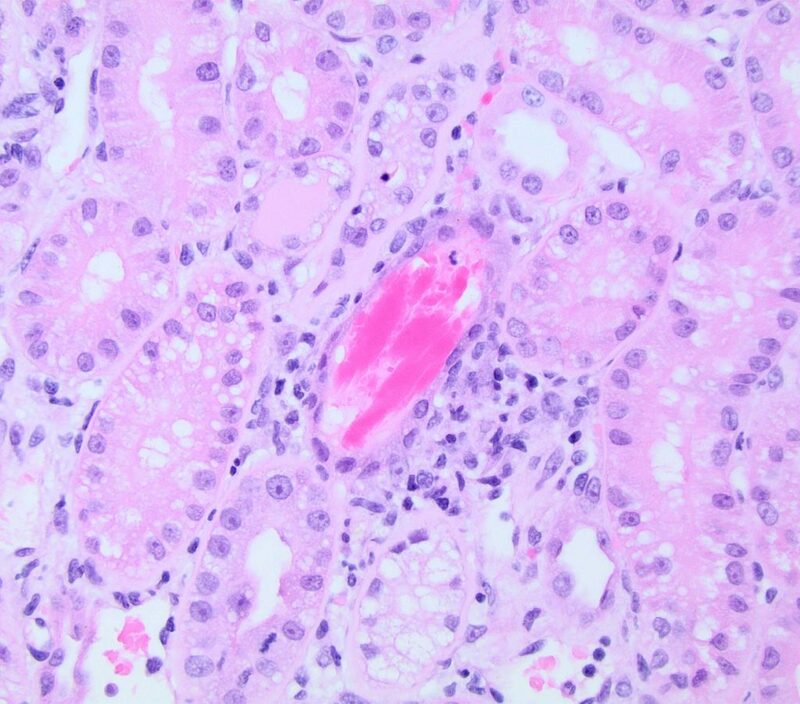 FIG.6E (JMS): Red blood cells do not take up silver so they are usually the color of the counterstain, in this case pink. INTERSTITIAL INFLAMMATION is typically composed of lymphocytes and plasma cells. 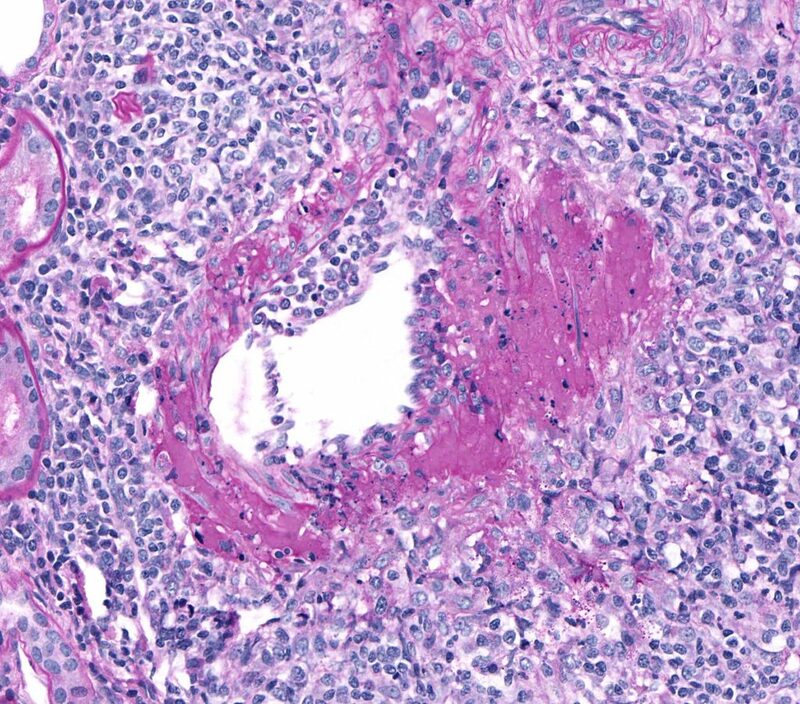 Macrophages may also be present, while neutrophils are not usually seen when the inflammation is secondary to glomerular disease. FIG.7A (HE): Tubules are moderately separated by mixed inflammatory infiltrates including lymphocytes, macrophages, plasma cells and neutrophils. There is also associated cytoplasmic vacuolization, cell necrosis, tubular attenuation, and large protein casts. 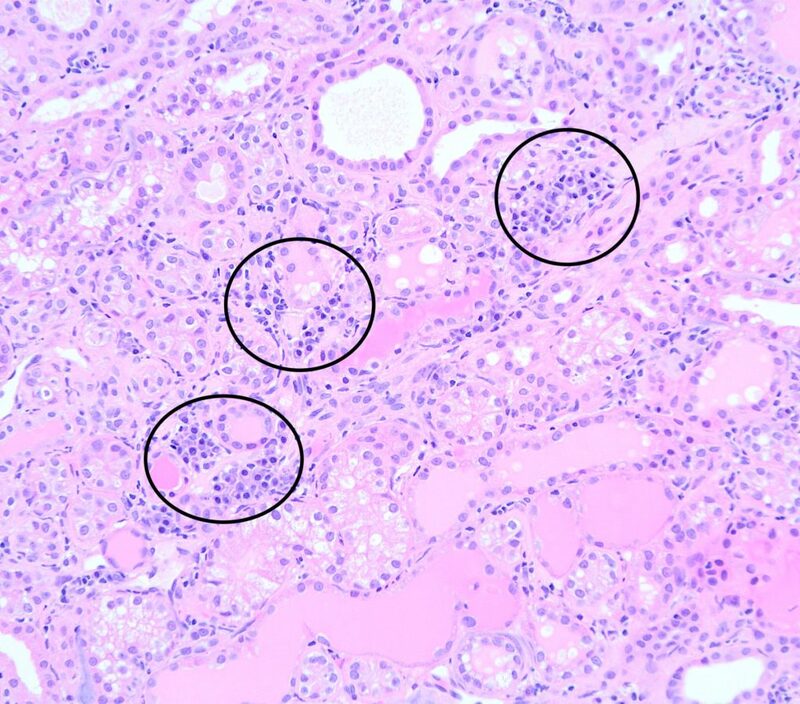 FIG.7B (HE): Neutrophils frequently surround degenerating tubules and sometimes are found in small aggregates. 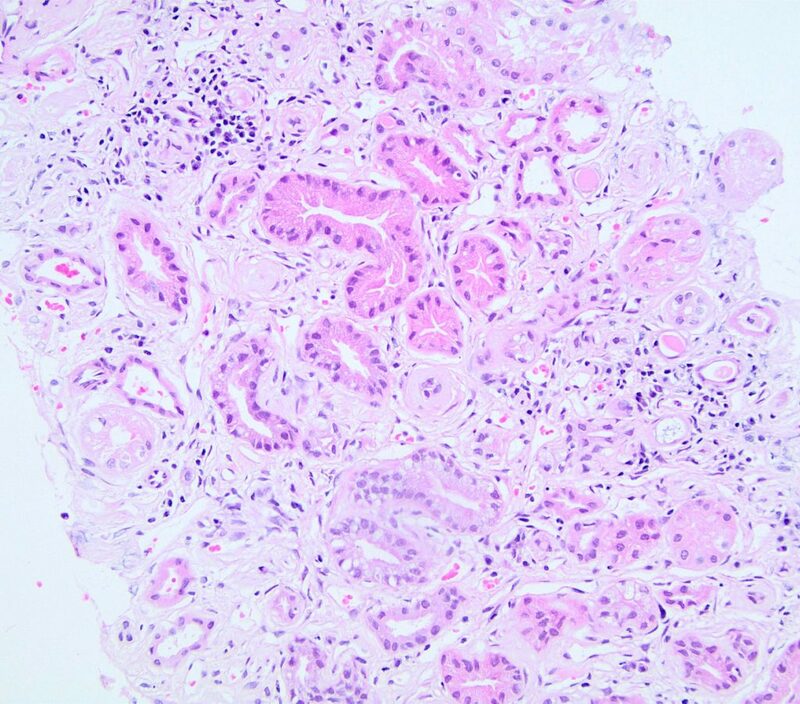 Tubular degeneration is characterized by loss of the brush borders, have swollen vacuolated cytoplasm and often contained sloughed pyknotic cells. FIG.7C (HE): A few neutrophils and a pyknotic cell are adjacent to a degenerating tubule. 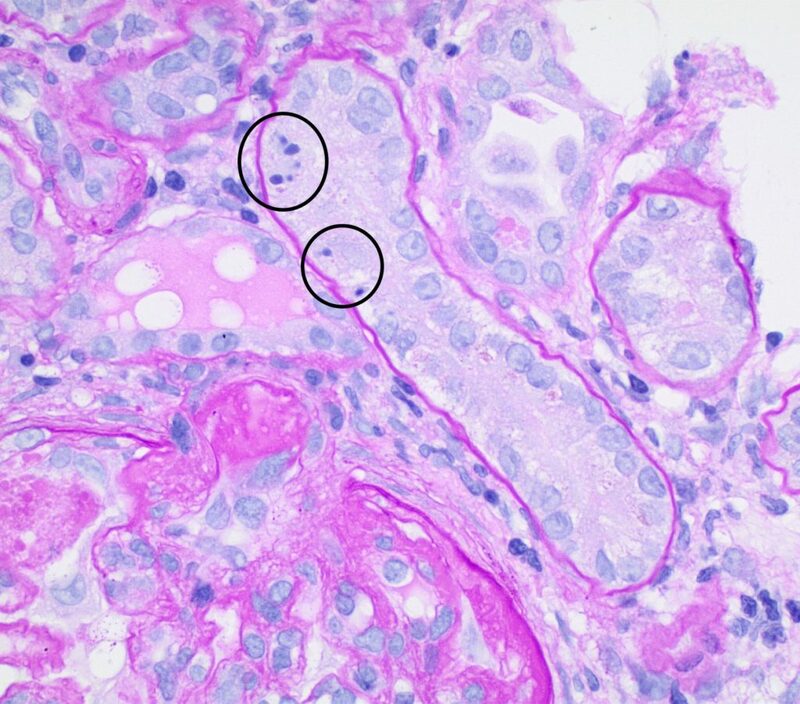 FIG.7D (HE): Individual and small aggregates of 10 to 20 lymphocytes and plasma cells are scattered throughout the interstitium (circled). Tubules are dilated and many contain protein casts. FIG.7E (PAS): It is more difficult to discern plamsa cells from lymphocytes with the PAS stain; however, this stain highlights the protein casts and demonstrates that there are atrophic tubules with wrinkled basement membranes hidden within the inflammatory aggregates. FIG.7F (MT): Similar to the PAS stain, discerning plasma cells from lymphocytes is difficult with MT. 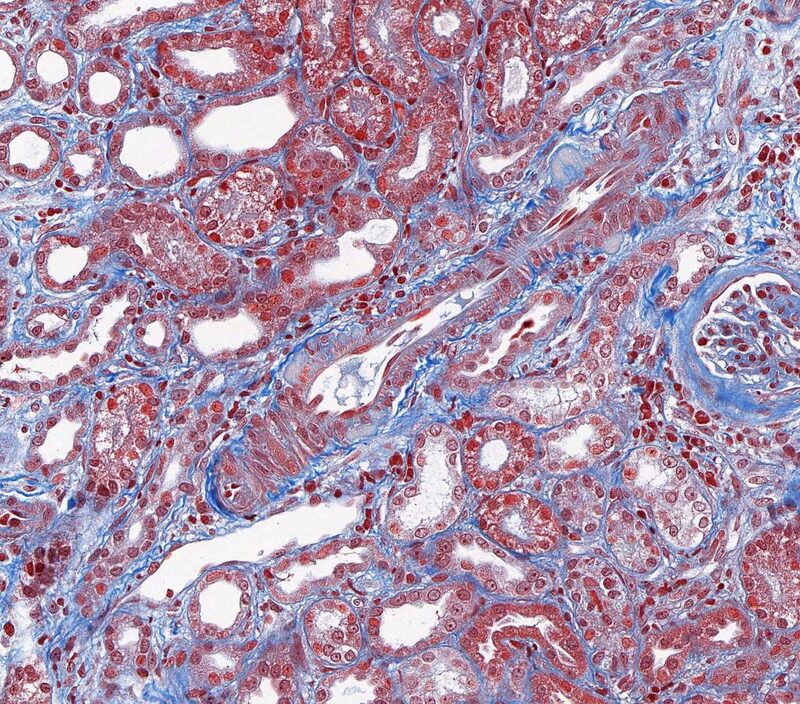 This stain shows that there is only minimal interstitial fibrosis and that separation of tubules is due to the interstitial inflammation and the thickened, atrophic tubules with wrinkled basement membranes. FIG.7G (HE): In some regions of the biopsy from the same patient as FIG.7A-C, there are larger regions of severe lymphoplasmacytic inflammation which replace tubules. The glomeruli in these regions are globally sclerotic (*). 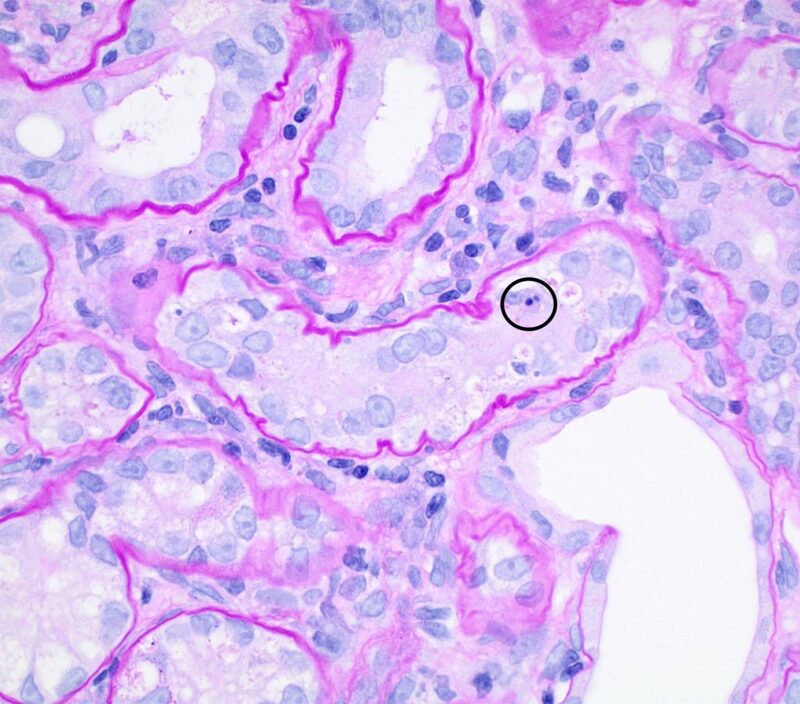 FIG.7H (PAS): The globally sclerotic and obsolescent glomeruli (*) sometimes are hypocellular meshworks of basement membrane material and the glomerulus at the right side of the image is no longer surrounded by a Bowman’s capsule. There are few small remnants of tubular basement membranes from atrophic tubules scattered throughout the inflammation. FIG.7I (MT): The MT demonstrates that the replacement of tubules is due to interstitial inflammation and minimal interstitial fibrosis. The globally sclerotic and obsolescent glomeruli (*) are meshworks of basement membrane collagen. FIG.8A (HE): The interstitium is expanded and tubules are moderately separated; however, it is difficult to discern the type of expansion by HE. Therefore, the MT is required to discern how much of the expansion is collagen as opposed to edema. FIG.8B (MT): The MT of this same area delineates the interstital collagen (pale blue) from the tubular basement membrane collagen which is a brighter blue. 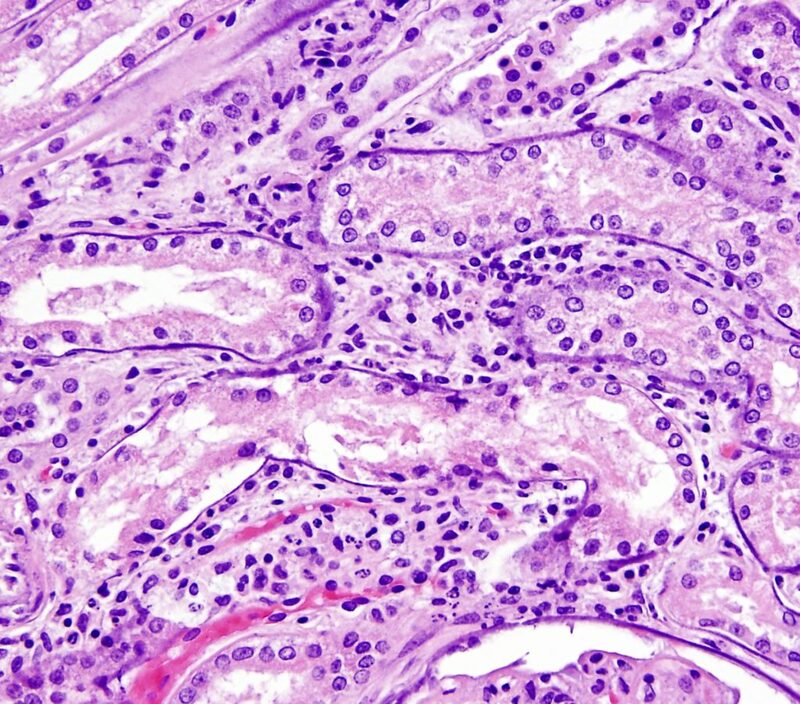 GLOMERULAR TUBULARIZATION refers to a lesion in which the parietal epithelium lining Bowman’s capsule has a cuboidal to columnar morphology, as opposed to squamous. 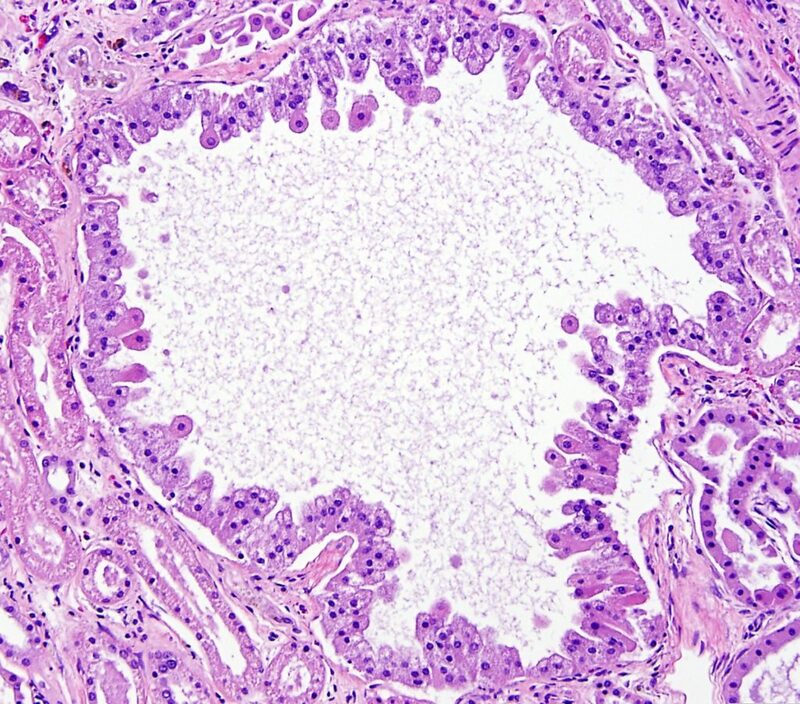 The cause is unknown and might represent replacement of lost squamous parietal epithelial cells by spreading of proximal tubular epithelium. Alternatively, it might be a reactive / metaplastic response of the original squamous parietal epithelium. FIG.9A (HE): At the tubular pole, the parietal epithelium has changed from squamous to cuboidal columnar and it is continuous with the proximal tubular epithelium. 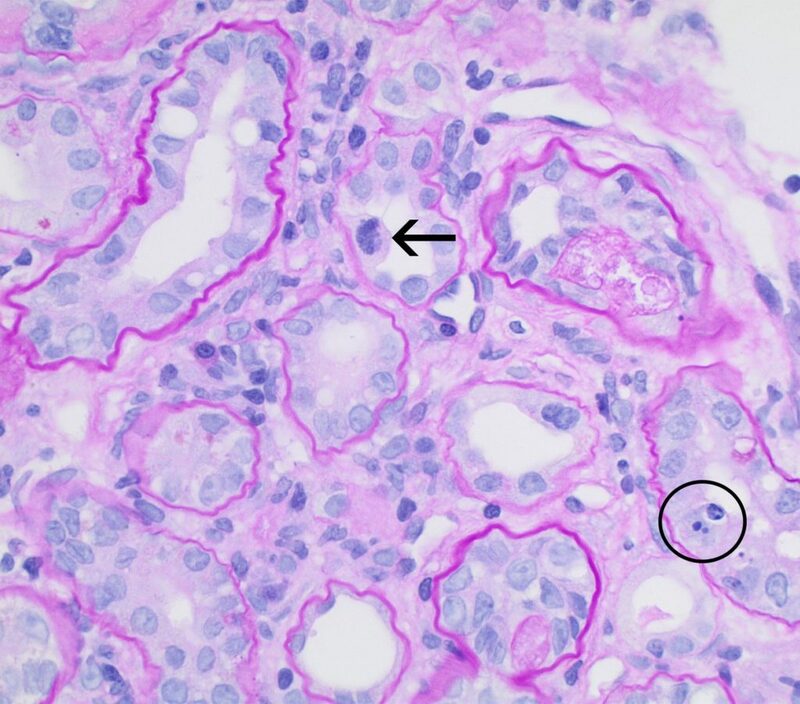 FIG.9B (PAS): The PAS stain of the same glomerulus demonstrates the presence of an apical brush border the parietal epithelial cells. 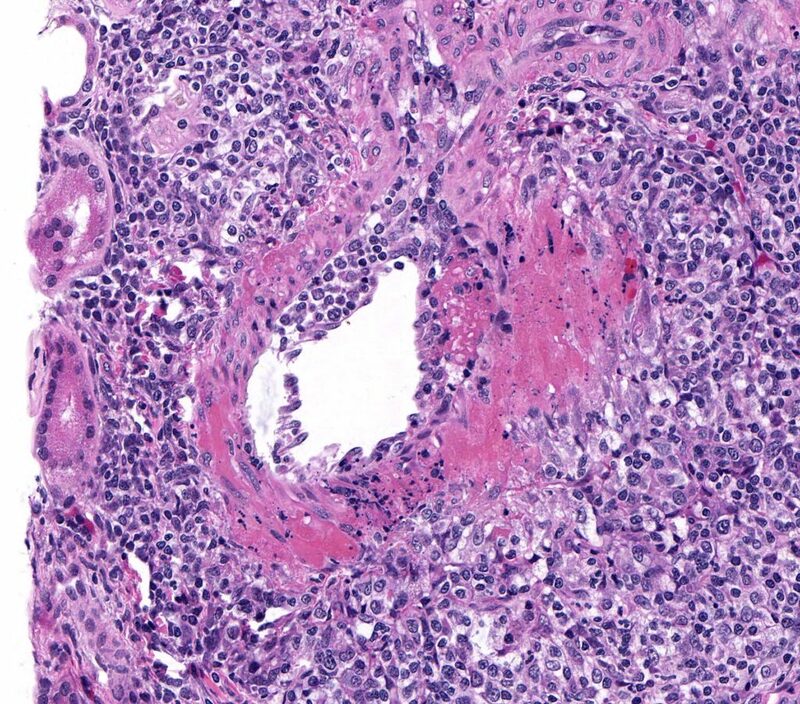 FIG.9C (HE): A different glomerulus from the same patient also demonstrates this lesion. The nuclei are basally located, similar to what is expected in proximal tubules. 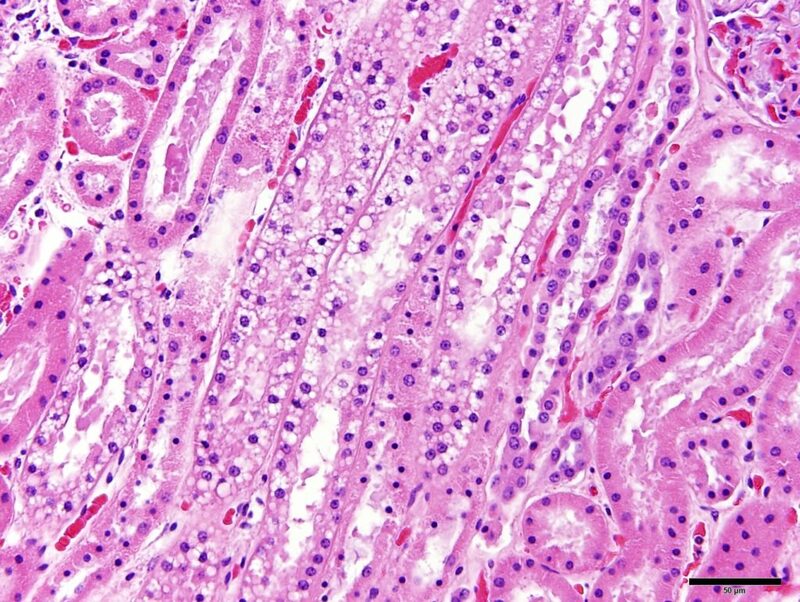 TUBULAR MINERALIZATION can be seen in proteinuric dogs with severe azotemia and associated hyperphosphatemia with or without hypercalcemia. 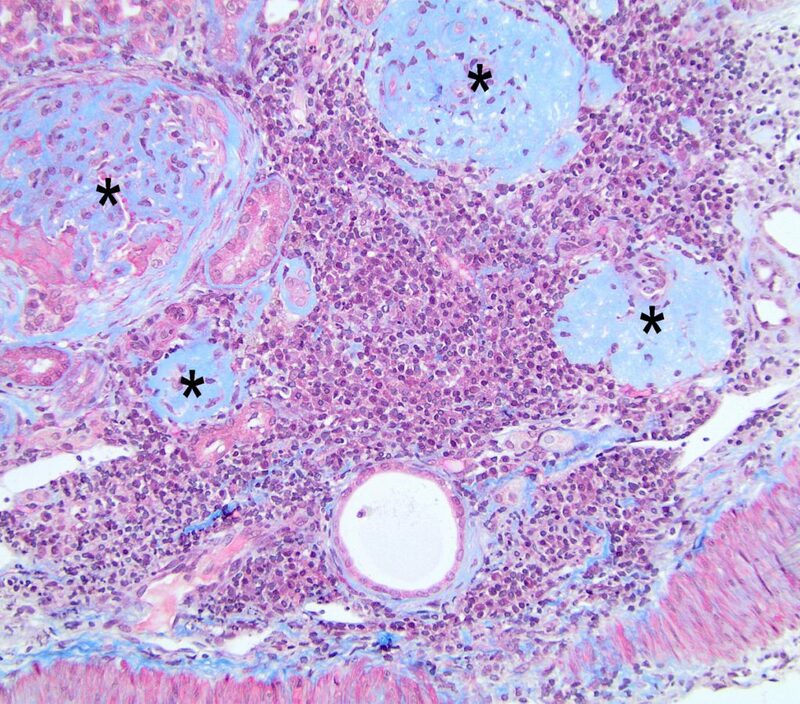 FIG.10A (HE): The mineral is basophilic and encircles all tubules as well as Bowman’s capsule basement membrane (lower right of image). There is also moderate interstitial inflammation. FIG.10B (HE): With mineralization of tubular basement membranes, there is often disruption / fracturing of the tissue during slide sectioning. FIG.10C (PAS): With the PAS stain, the mineral is bright pink / magenta. 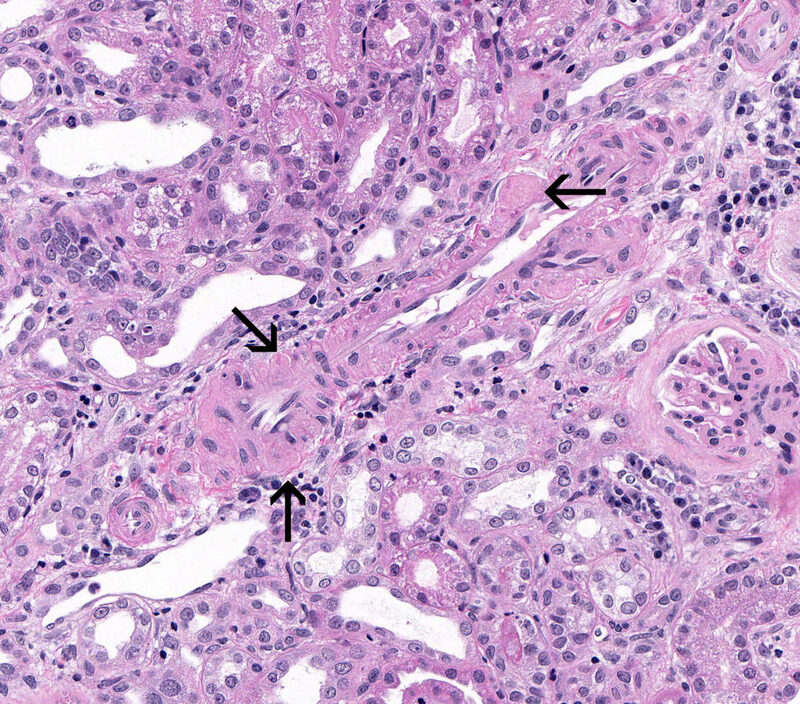 FIG.10D (MT): Note the dense interstitial fibrosis surrounding the tubules with pale blue mineralization of the basement membranes (arrows). 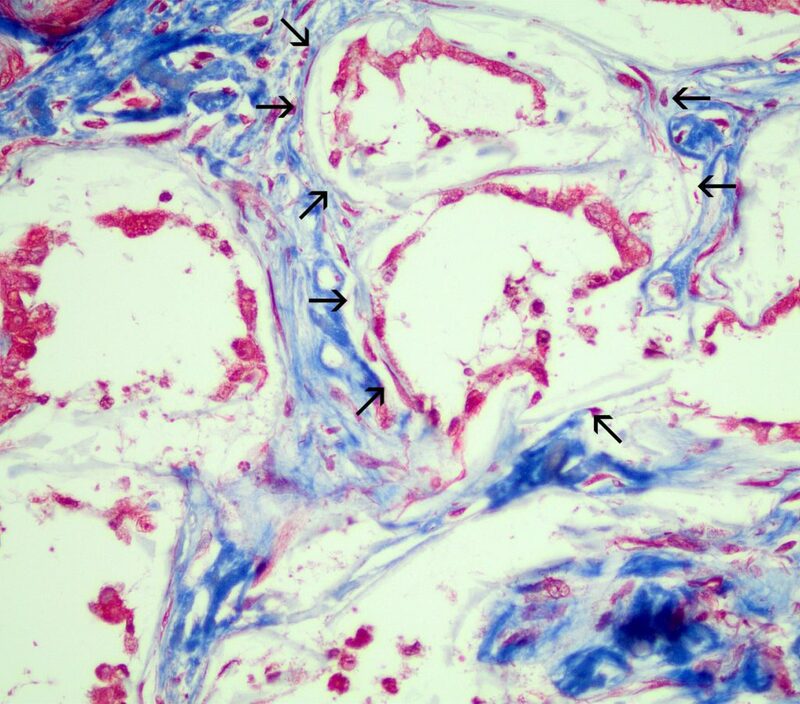 FIG.10E (HE): There is basophilic mineralization of wrinkled basement membranes surrounding atrophic tubules. FIG.10F (PAS): This stain highlights the wrinkled, thickened basement membranes. TUBULAR ATROPHY is observed along with interstitial fibrosis and is an outcome of tubular injury. It is best observed with basement membrane stains as tubular basement membranes are often wrinkled and thicken with atrophy. Tubular epithelial cell size is also reduced or non-existent. 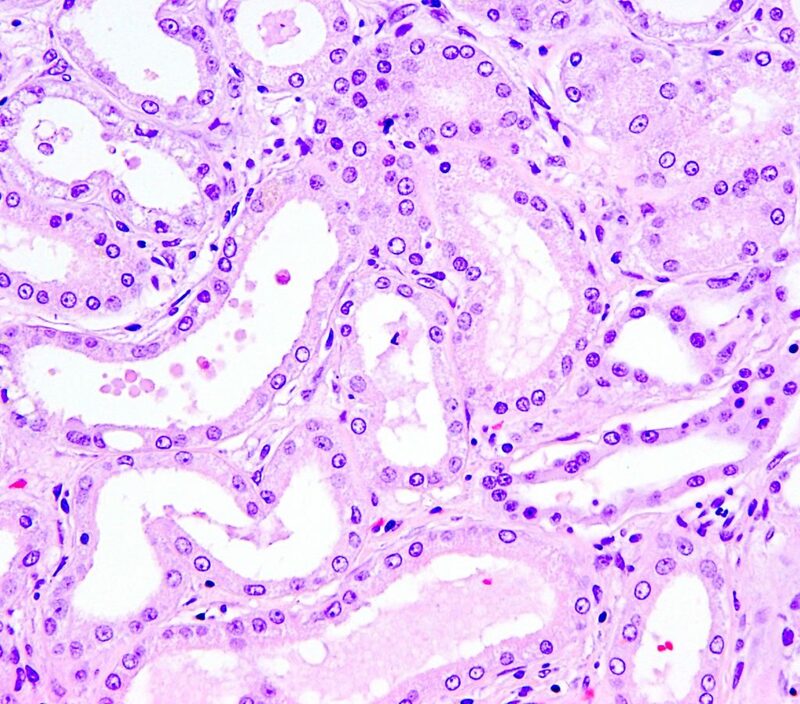 Varying degrees of INTERSTITIAL FIBROSIS is often seen surrounding the atrophic tubules. FIG.11A (PAS): The PAS stain emphasizes the wrinkling and multi-lamination of the basement membranes of the atrophied tubules. 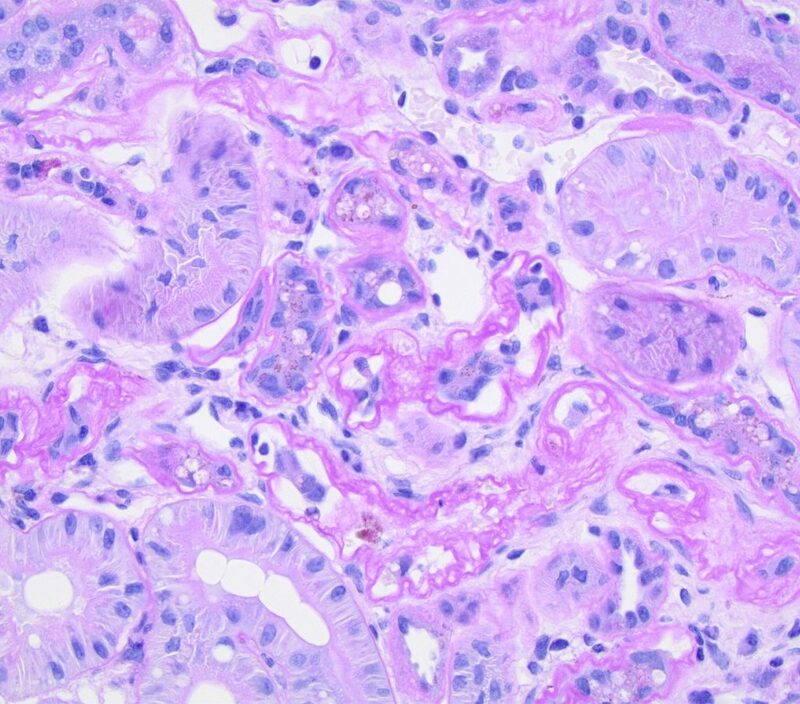 There is mild interstitial fibrosis. 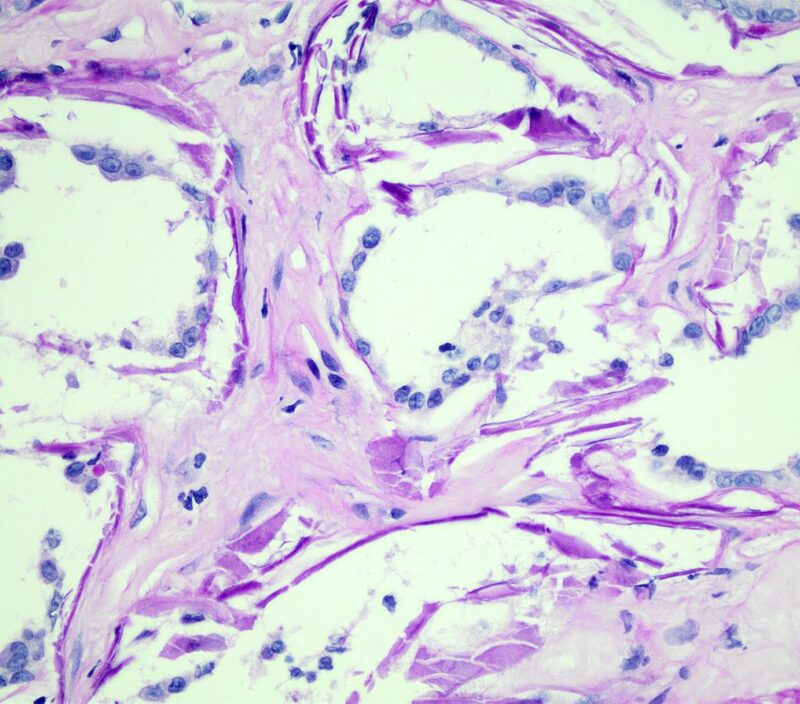 FIG.11B (HE): There is mild to moderate fibrosis in between the tubules, many of which are undergoing atrophy. 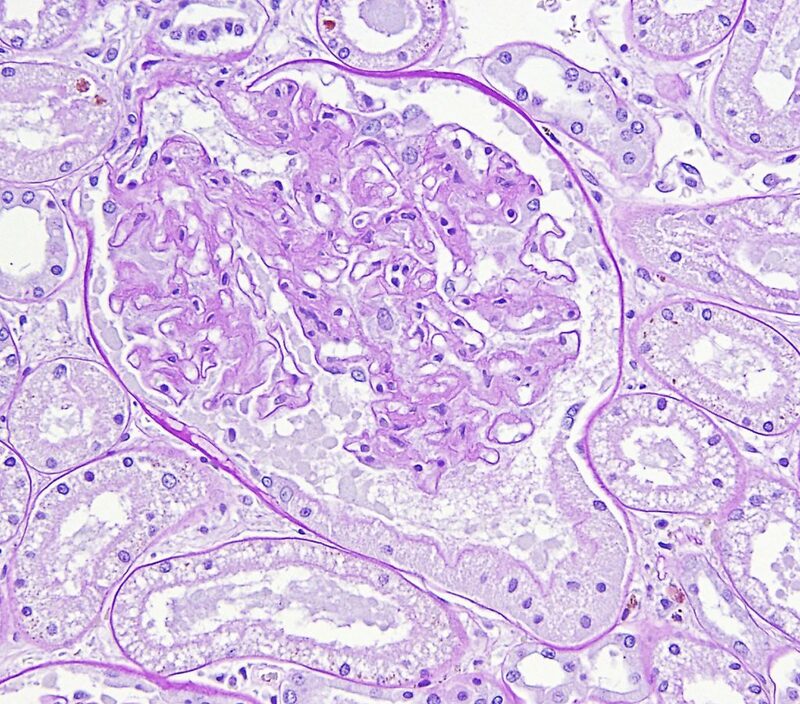 The glomerulus demonstrates a membranoproliferative pattern and the patient had immune complex mediated membranoproliferative glomerulonephritis. 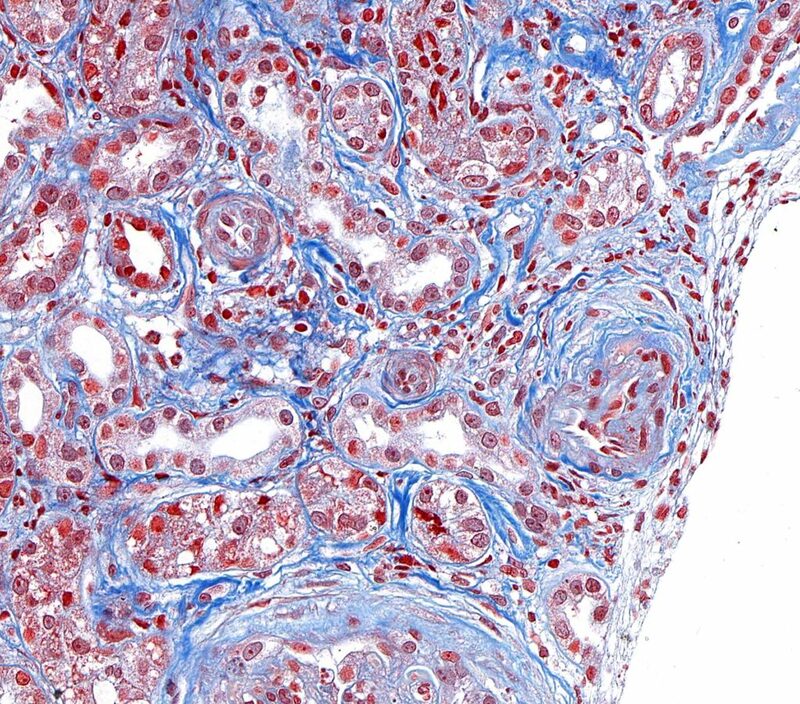 FIG.11C (PAS): This stain enables the differentiation of the atrophic tubular basement membranes from the increased amounts of interstitial collagen. 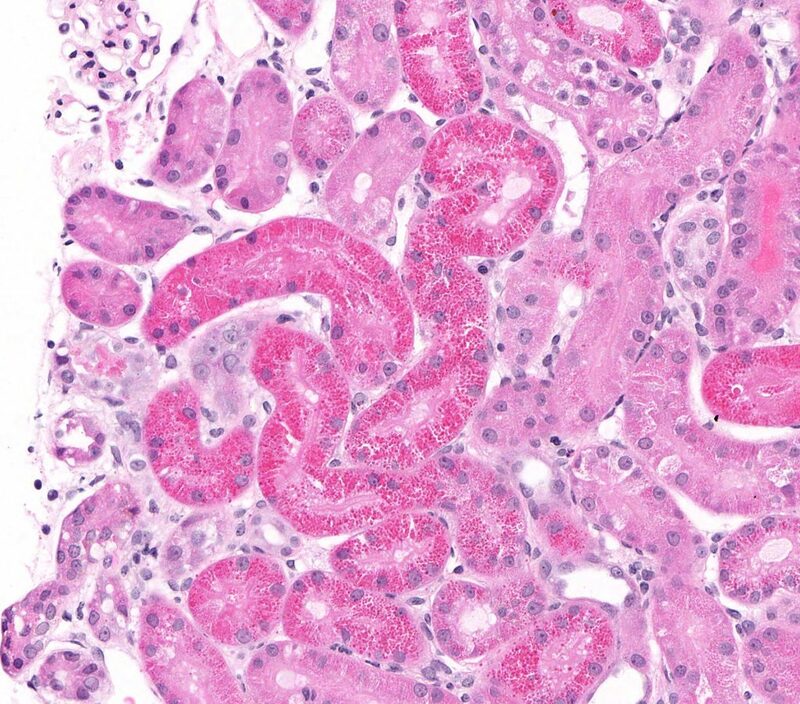 ARTERIAL / ARTERIOLAR HYALINOSIS is histologically characterized by homogeneous, pink thickening of the walls of arteries and arterioles with loss of structural detail, and with narrowing of the vascular lumen. The term ‘hyalin’ denotes a glassy appearance to distinguish it from the more granular / fibrillar appearance of vascular fibrinoid necrosis. FIG.12A (HE): There are small nodular expansions of the smooth muscle wall of this intralobular caliber artery. Hyalinosis can sometimes be a subtle lesion and difficult to detect on HE slides. FIG.12B (PAS): Hyalinosis is much easier to see with the PAS stain as dark pink to magenta nodular expansions of the arterial wall. FIG.12C (MT): With MT, the hyalinosis is usually pale peach to orange. 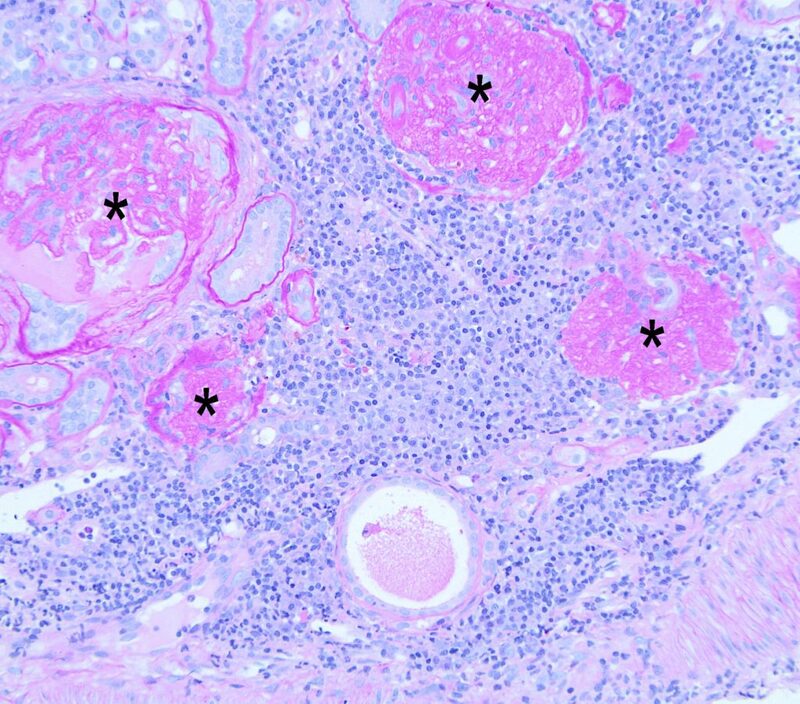 FIG.12D (HE): There are small foci of pink hyalinosis in this artery. FIG.12E (PAS): Again the PAS method enable easy detection of the hyalinosis in this arterial wall. FIG.12F (MT): The hyalinosis of this artery is orange red (compare to Figure 12C). HYPERPLASTIC ARTERIOSCLEROSIS / ARTERIOLOSCLEROSIS, on the other hand, is histologically seen as a concentric, laminated thickening of arterial and small arteriolar walls, respectively. This lesion has an ‘onion skin appearance’ with progressive narrowing of the lumina. By transmission electron microscopy, the laminations are shown to consist of smooth muscle cells and thickened and reduplicated basement membranes. 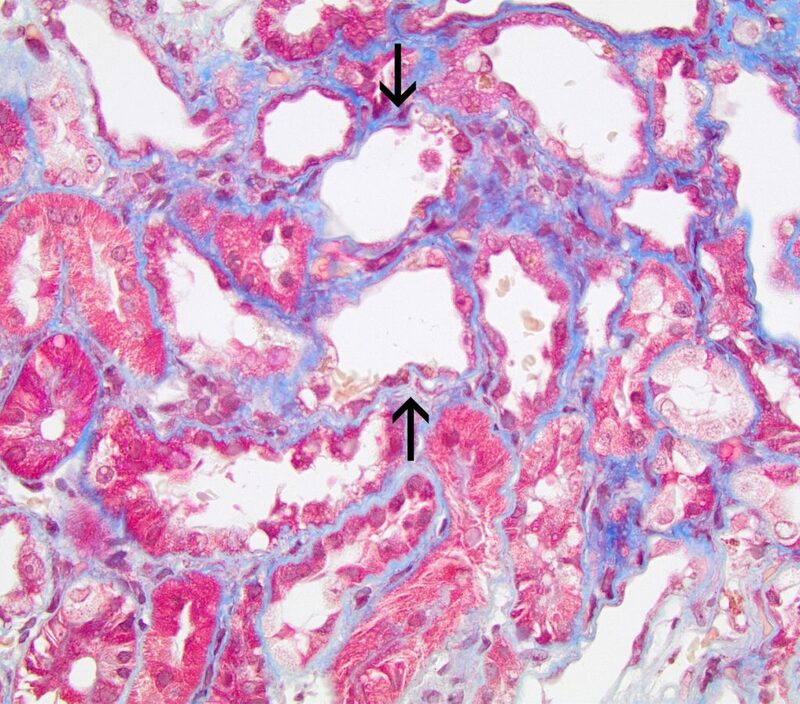 FIG.13A (HE): These small arteries and aterioles are surrounded by mesenchymal cells. By HE, it can be difficult to differentiate the mesenchymal cells encircling the vessels from interstitial fibrosis. 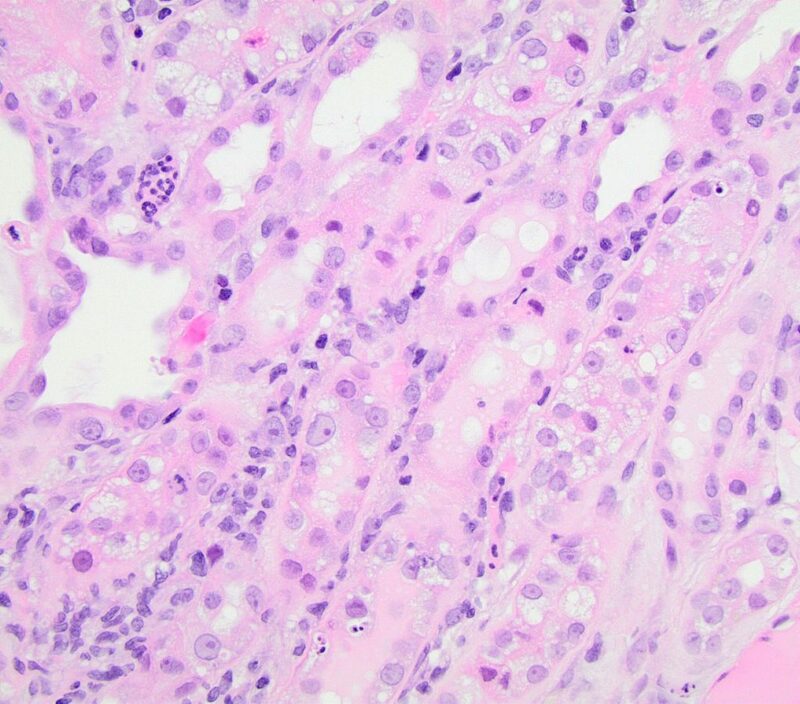 FIG.13B (PAS): PAS highlights the mesenchymal cells with prominent nuceli that encircle the vessels. FIG.13C (MT): The onion-skiinned appearance is due to the cells and admixed collagen that encircle the vessels. FIBRINOID NECROSIS refers to the bright pink smudgy appearance of the vessel wall. This material morphologically looks like fibrin, but is mainly composed of necrotic tissue, immune complexes and complement. When there is nuclear debris associated with the fibrinoid change, the lesion can be called FIBRINOID ARTERITIS or LEUKOCYTOCLASTIC ARTERITIS. FIG.14A (HE): The entire vessel wall is obscured by smudgy to granular eosinophilic material (fibrinoid change). 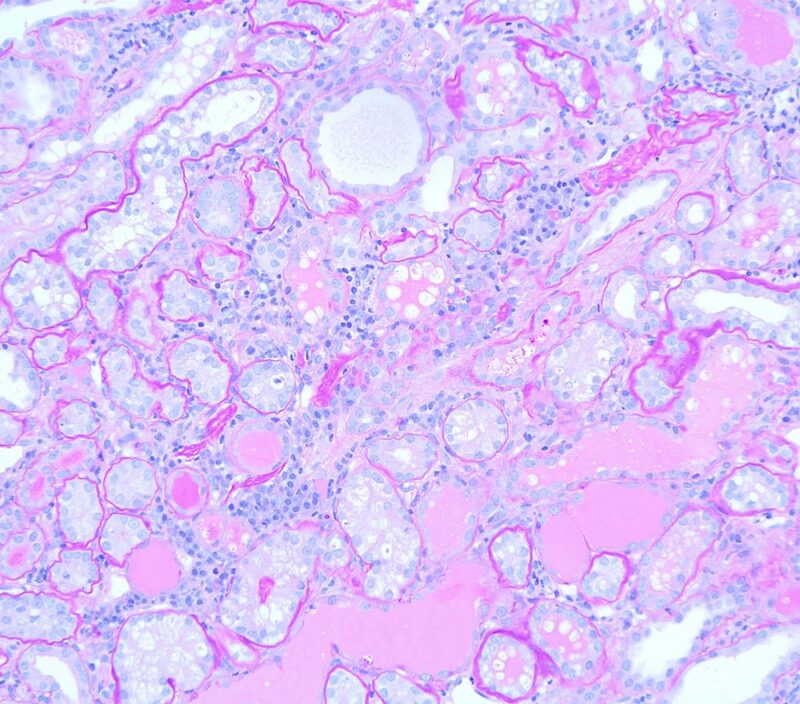 There is necrosis of the smooth muscle wall and abundant pyknotic nuclear debris. 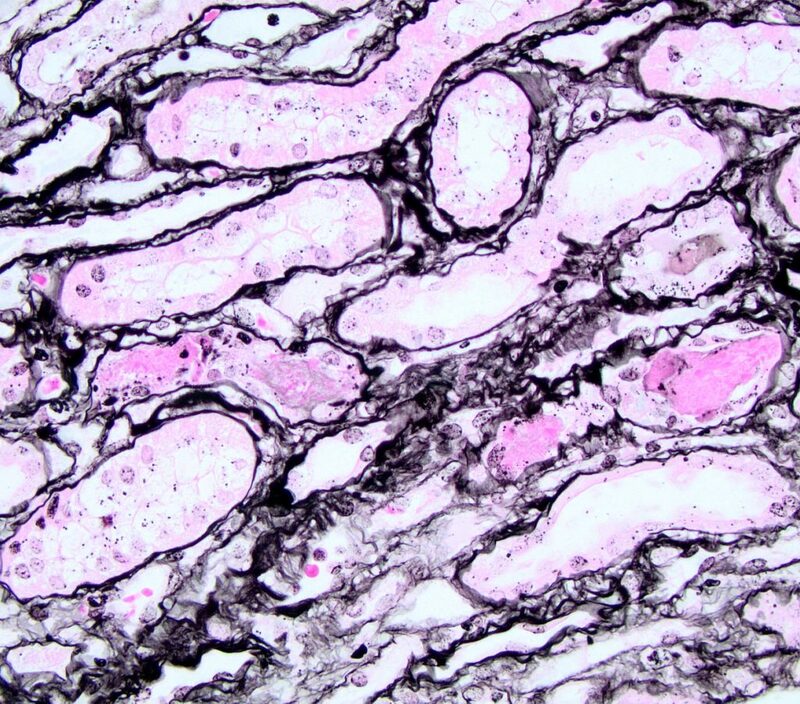 FIG.14B (PAS): With the PAS stain, the fibrinoid change is bright pink. 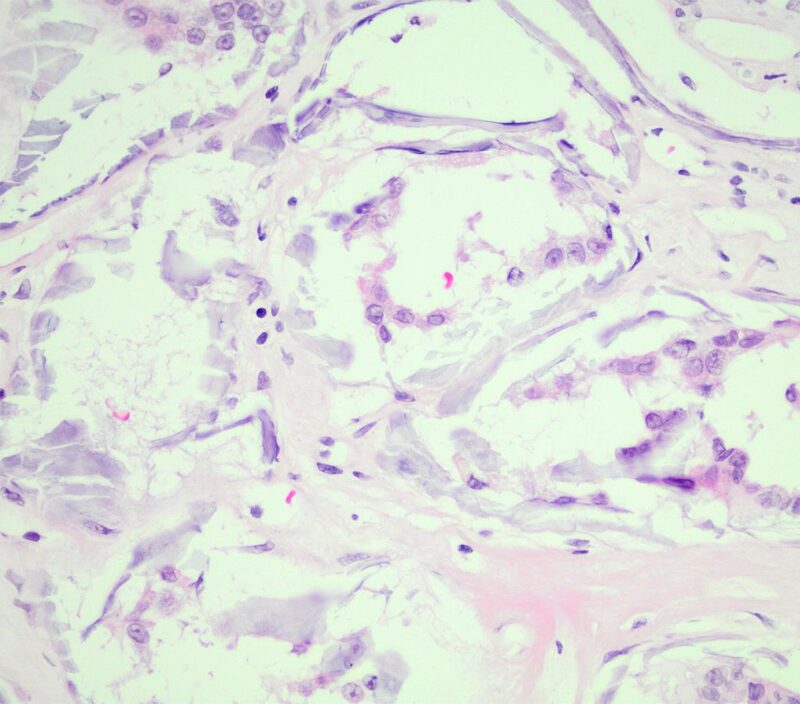 This stain also highlights the accumulation of inflammatory cells beneath the hypertrophied endothelium, further supporting the diagnosis of arteritis in this case. FIG.14C (MT): The fibrinoid material is bright orange to red when stained with MT. ADDITIONAL TUBULOINTERSTITIAL CHANGES WHICH ARE ARTIFACTUAL OR WITHIN NORMAL LIMITS. 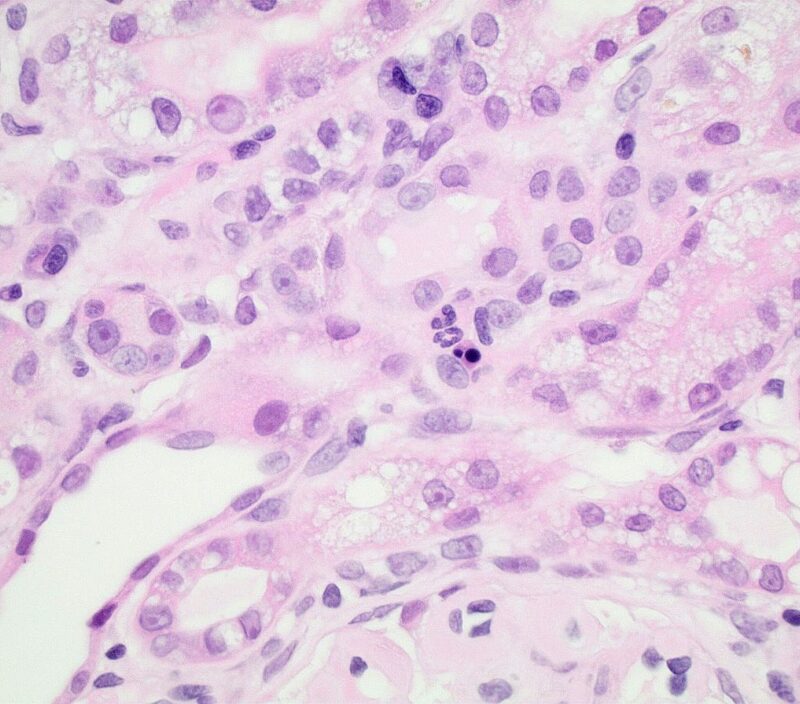 FIG.15A (HE): Tubular epithelial cells have large nuclei with a speckled appearance. They often have circular clear spaces in the cytoplasm and frothy material in tubular lumens. 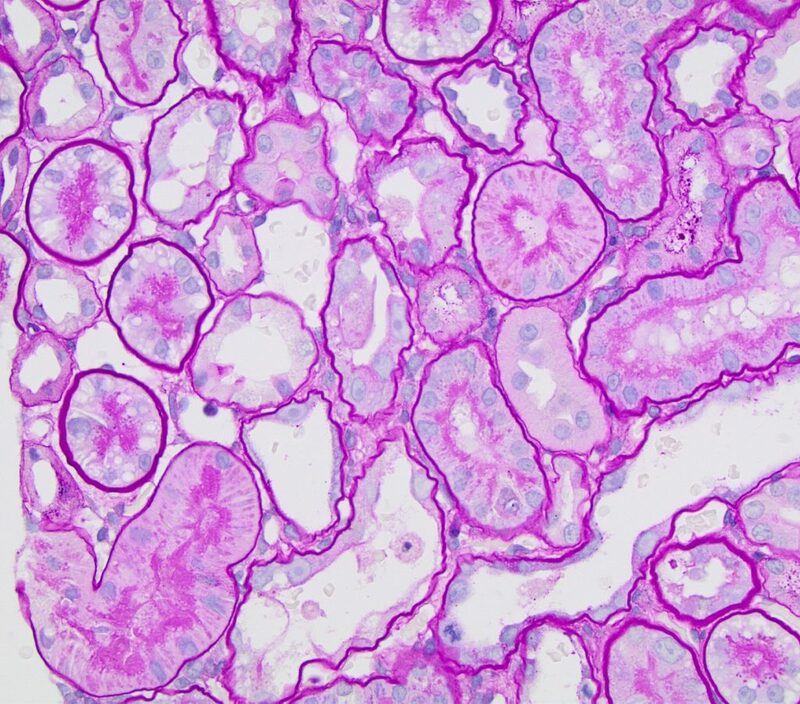 With autolysis, proximal tubular epithelial cells detach and “herniate” into Bowman’s space, compressing the glomerular tuft. FIG.15B (HE): The tubules in the medullary rays (which contains the straight portion of the proximal tubule) frequently contain lipid in healthy dogs. FIG.15C (HE): Marked dilation of tubules is a common finding. 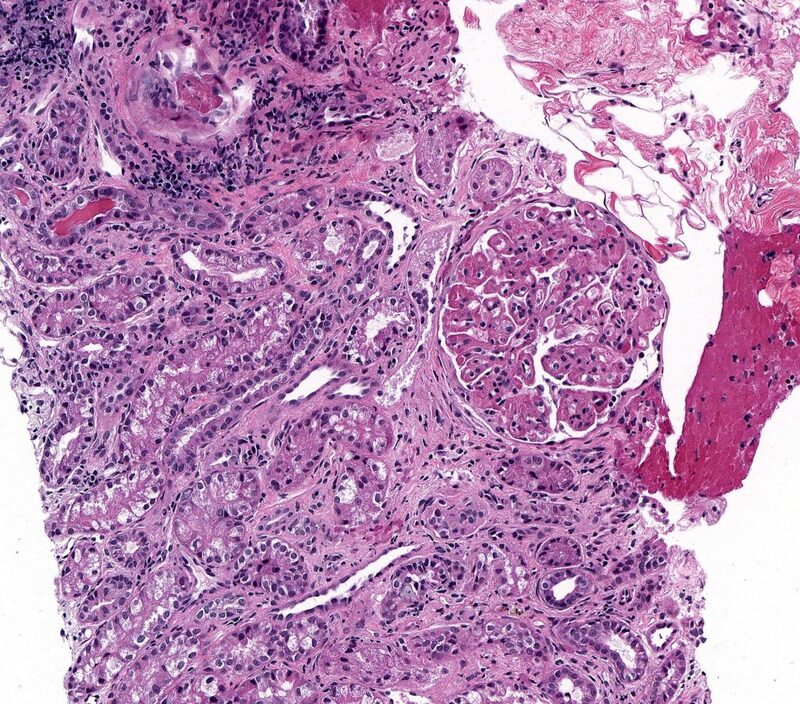 Tubular epithelial cells lining the cysts can range from cuboidal to tall columnar to tombstone-shaped (depicted above). Usually tubular cysts are incidental lesions but if they are large or numerous, they can act similarly to other space-occupying masses. 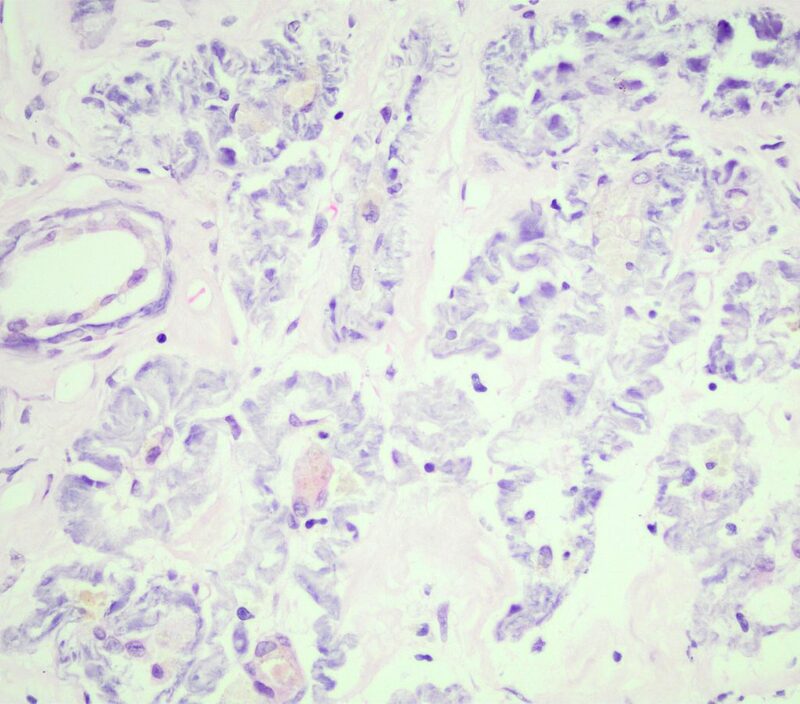 FIG.15D (PAS): PAS stain of the above image.